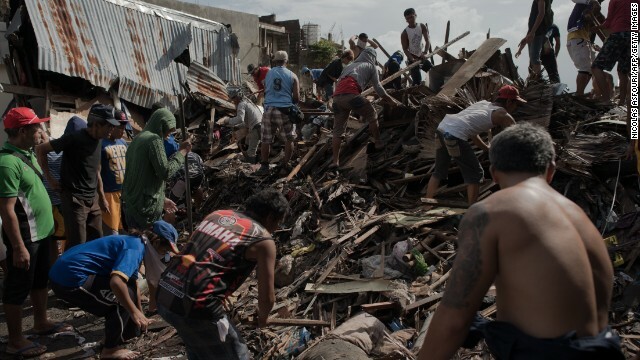 Anderson Cooper is live from the Philippines with stories of courage amid the destruction. "AC360°" 8 and 10 p.m. ET Tuesday on CNN. 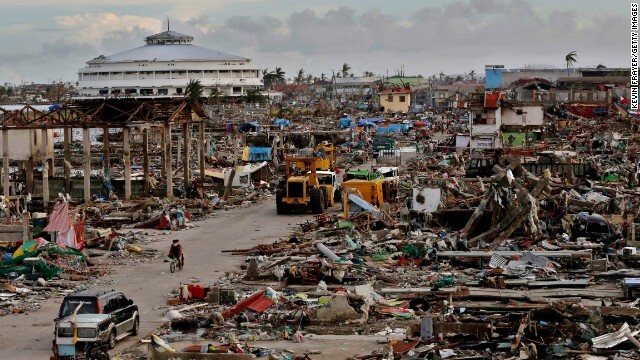 Tacloban, Philippines (CNN) -- Desperate pleas for food and water forced aid organizations and nations around the world to scramble Wednesday to deliver supplies four days after Typhoon Haiyan flattened areas of the Philippines, where bodies still litter the streets in one devastated province. Rain from a tropical depression grounded some relief flights, while blocked roads and poor conditions at some airports made delivering other aid a difficult proposition, increasing the misery of survivors and raising anxiety. "I fear anarchy happening in Tacloban City," said CNN iReporter Maelene Alcala, who was on vacation in Tacloban where the typhoon struck and was evacuated to Manila. "It's like survival of the fittest." 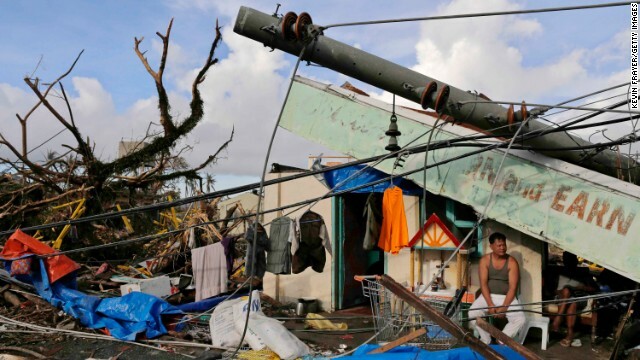 Tacloban, the provincial capital of the island of Leyte, was ground zero for the typhoon that struck Friday, leaving the city in ruins and its population of more than 200,000 in desperate conditions. 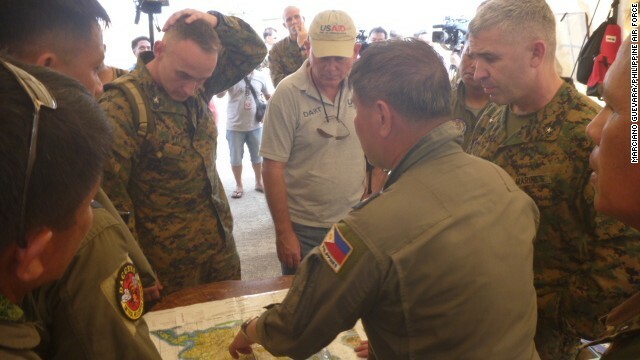 Lieutenant Colonel Marciano Guevara from the Philippine Air Force spent half a day in disaster-struck Tacloban surveying the area and coordinating relief work on Monday. 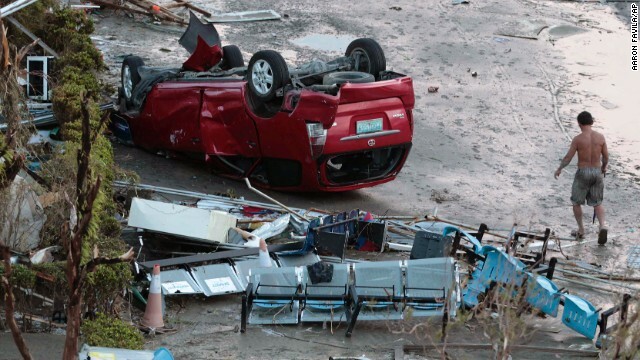 These are some of his photos and impressions of the typhoon aftermath as told to CNN's Diego Laje. 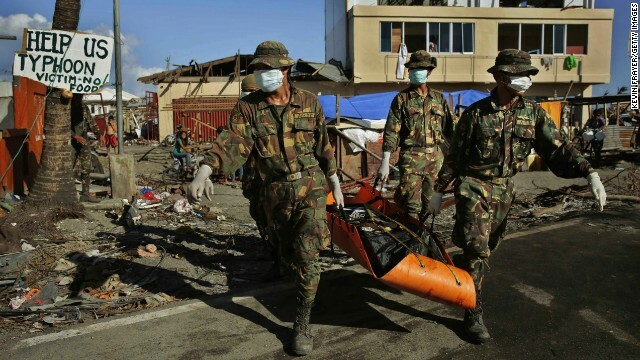 Streets are filled with survivors, foreign rescue personnel and local security forces wading through the debris, says Guevara. The military men's response after witnessing the death and devastation was "tears, shaking and very sorry for what happened," says Guevara. Trucks loaded with relief supplies line up along the road that connects the Mactan air base to the runway at Cebu International Airport. 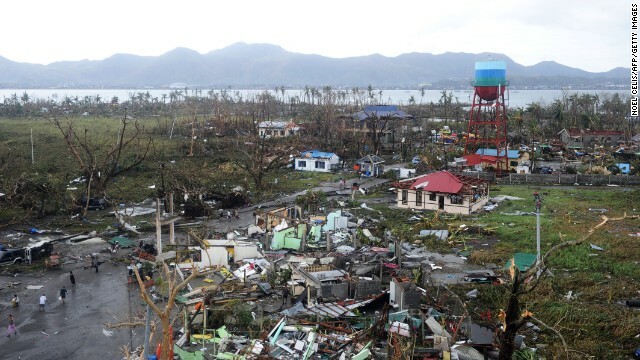 What started as a planning mission inspecting the area in Tacloban became a personal journey of horror and hope, said Guevara after witnessing the damage. Guevara describes feelings of devastation and heartache after his visit. "These are trials, but positively, it gives a different view towards a better tomorrow," he said. Mactan base serves local and overseas military transport planes around the clock. Guevara says moral support from the international community "keeps us going." 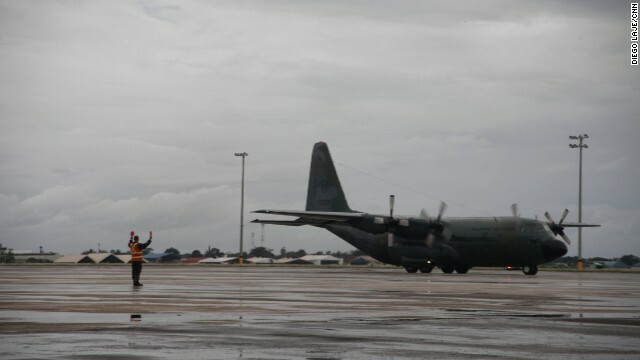 A Philippines Air Force C-130 lands at Mactan base in Cebu International Airport. 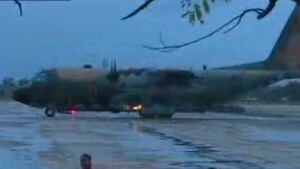 The plane helped rescue survivors of the tragedy. 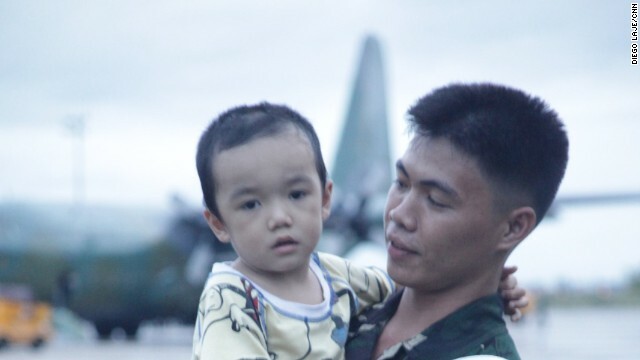 A child is comforted by a soldier after being rescued and brought to Mactan Air Base. 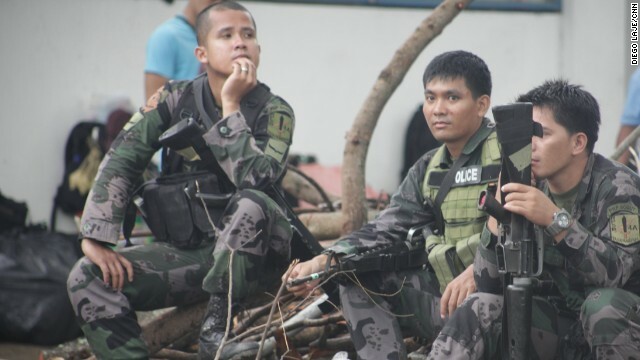 A battalion of the Philippine National Police was mobilized to help bring calm to Tacloban. This unit will travel by sea, as air transport is used for basic supplies and other urgent travel. 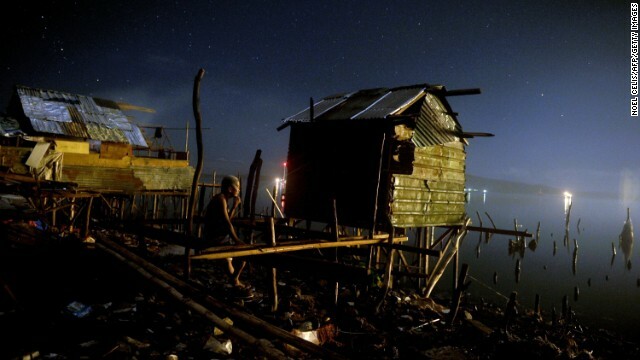 International support "keeps us going"
A man reconstructs his house in the bay of Tacloban, Leyte province, Philippines, on Wednesday, November 27, 2013. 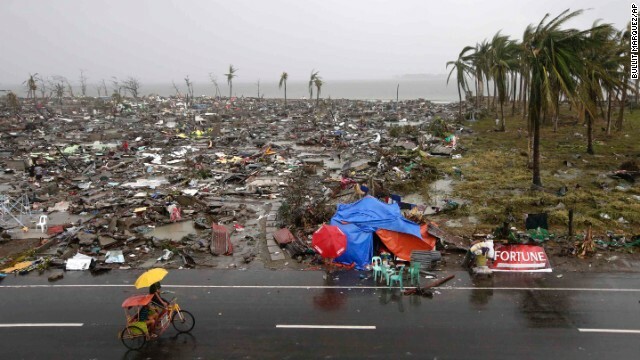 Typhoon Haiyan, one of the most powerful storms on record, hit the country's eastern seaboard on November 8, leaving a wide swath of destruction, including more than 5,000 deaths. 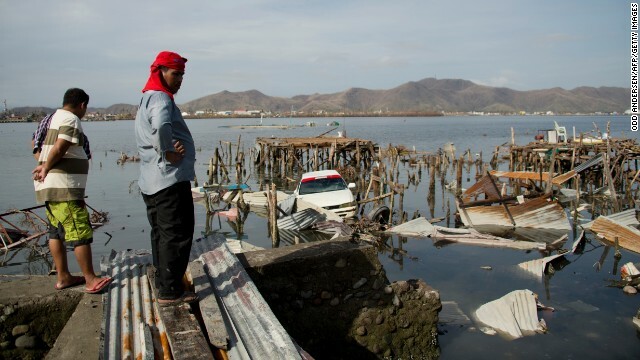 A man rests on his damaged house along the shore in Tacloban on Monday, November 25. Road traffic moves past destroyed houses in Palo, Leyte province, on Sunday, November 24, weeks after typhoon Haiyan caused heavy damage to life and property in the Philippines. A woman rests inside the damaged Our Lady of Guadalupe shrine in Tacloban, Philippines, on Sunday, November 24. 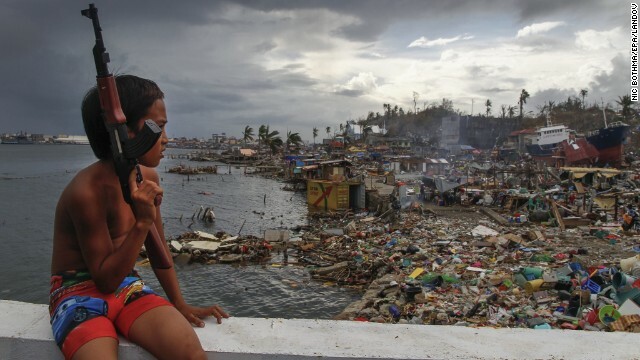 A woman looks over the devastated waterfront in Tacloban on November 24. 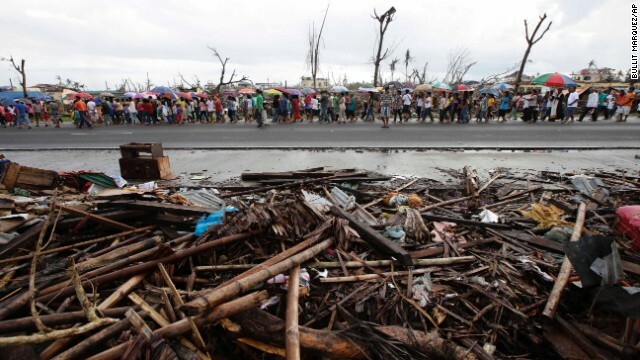 Typhoon survivors walk down a road in Palo, Philppines, during a procession for typhoon victims on November 24. 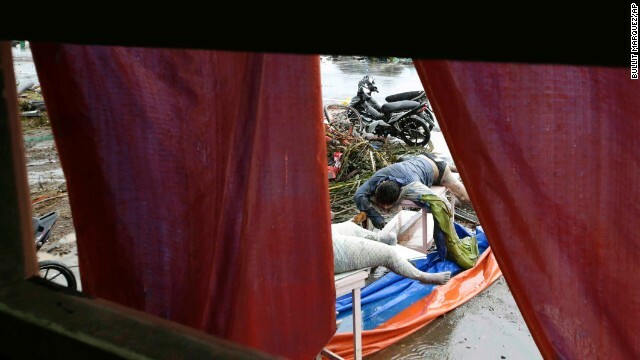 A vehicle lies in the water in Tacloban on Saturday, November 23. 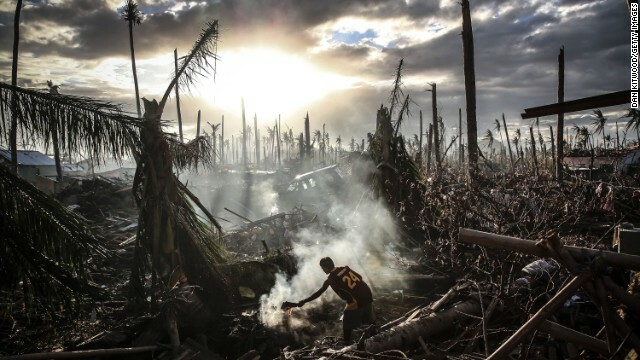 A man searches through the debris in Tacloban on November 23. 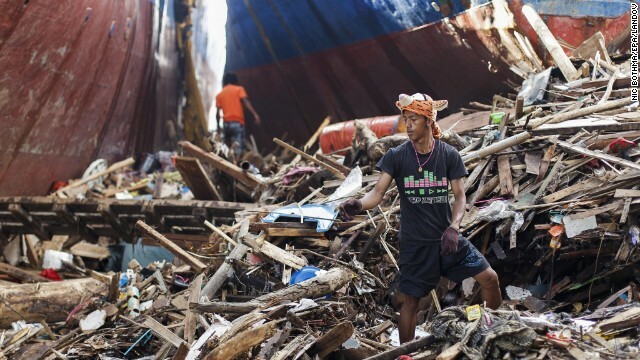 A man scavenges piles of wood amid damaged container vessels on November 23 in Tacloban. 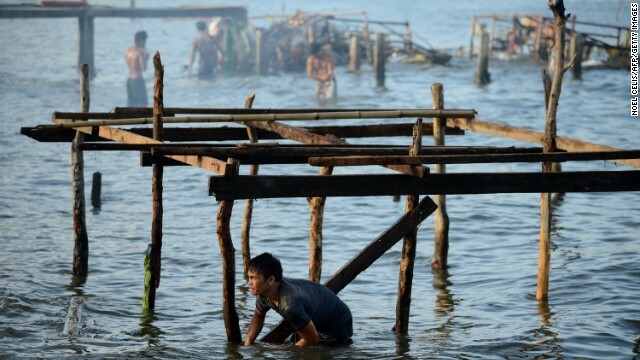 Local people begin to help clear debris near the shoreline where several tankers ran aground on November 23 in Leyte. 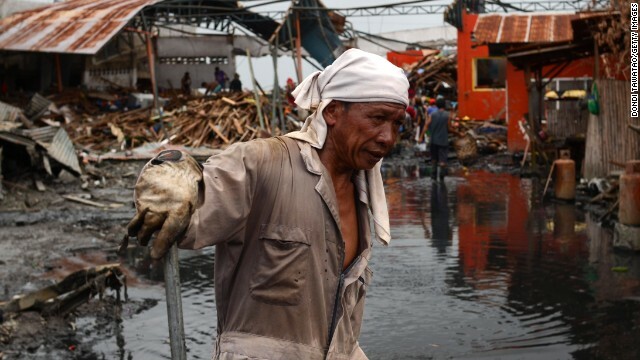 The death toll from the storm stands at more than 5,000, according to a government-run news agency. 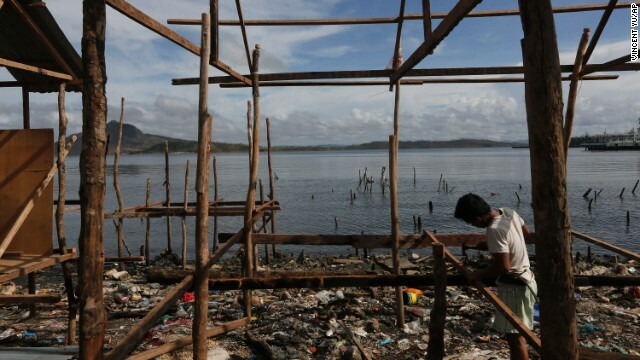 A man clears debris from in front of his home near the shoreline on November 23 in Leyte. 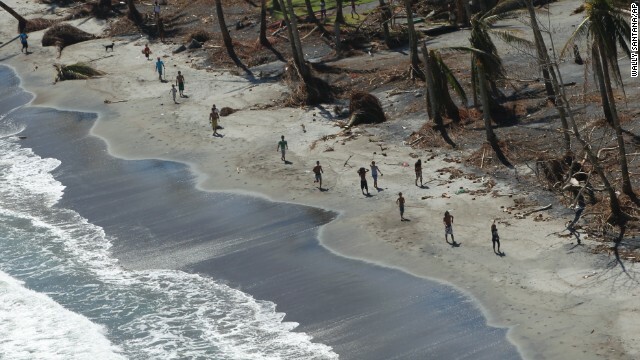 Groups of men clear debris near the shoreline on November 23 in Tacloban. 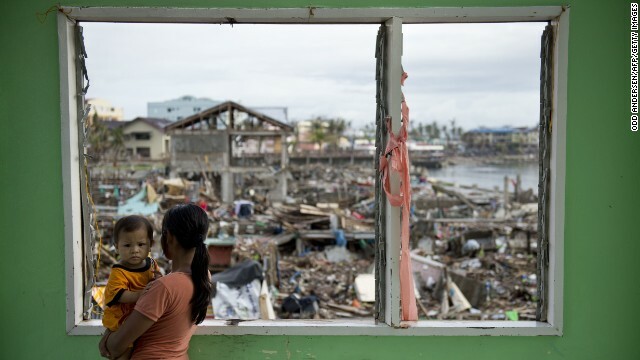 Survivors of Typhoon Haiyan inspect the damage to their houses in Tacloban, Philippines, on Friday, November 22. 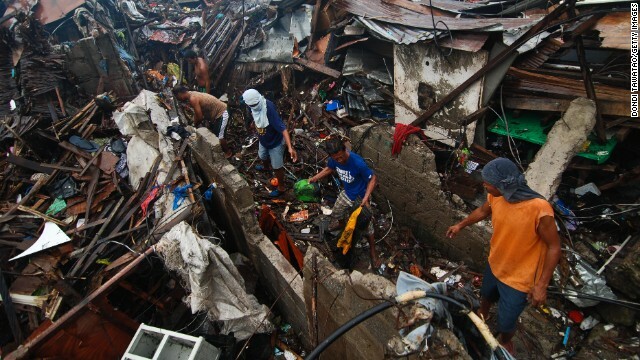 Filpinos clear rubble from a hard-hit area in Tacloban on November 22. 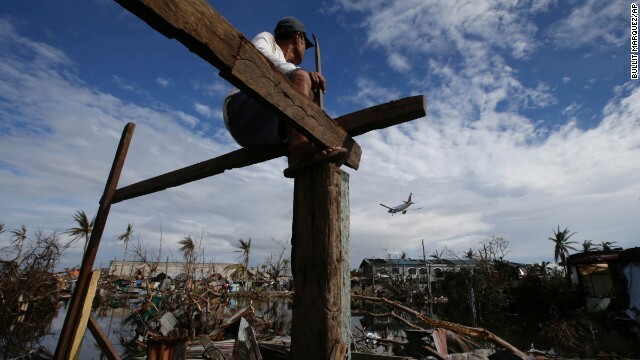 An airplane lands in Tacloban as Antonio Lacasa rebuilds his house on Thursday, November 21. People carry a coffin through an opening in the wall of a public cemetery for burial in Tacloban on November 21. A member of the Philippine air force drops relief goods for survivors in Tolosa on November 21. 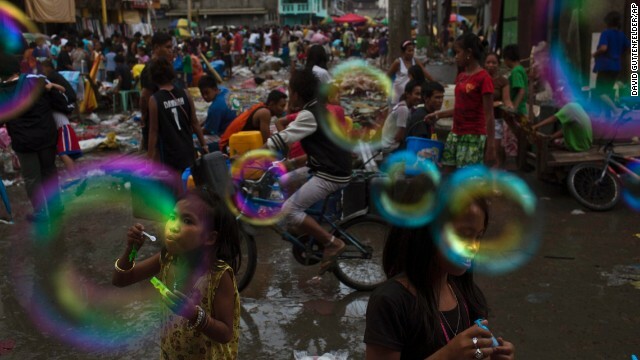 Children blow bubbles in a destroyed market in Tacloban on Wednesday, November 20. 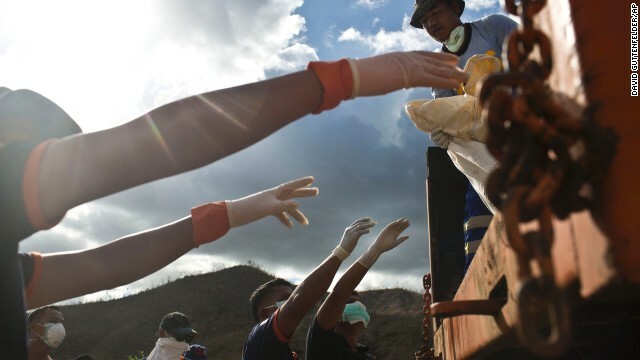 Workers clear mud and debris in Tacloban on November 20. 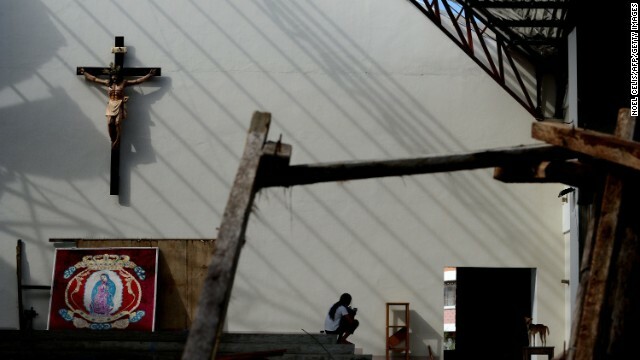 A boy climbs across debris in Tacloban on November 20. 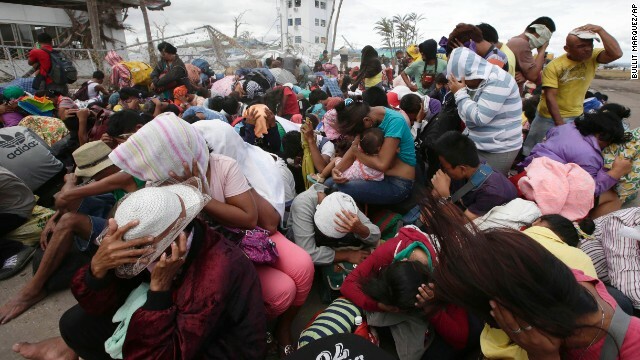 People at the airport in Tacloban react to a blast of wind from an aircraft on November 20. A man walks through water in the typhoon-ravaged city of Tacloban, Philippines, on November 20. A man sleeps on Tuesday, November 19, on a tanker that ran aground during Typhoon Haiyan in Tacloban. 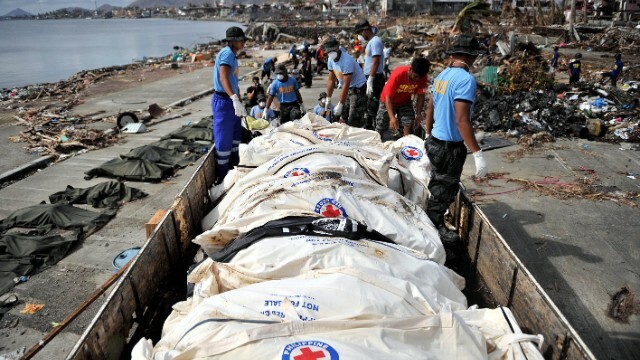 Firemen unload bodies November 19 for forensic experts to register and bury in a mass grave outside of Tacloban. Firemen unload more victims outside of Tacloban on November 19. A man fans the flames of a fire in Tanauan, Philippines, on November 19. 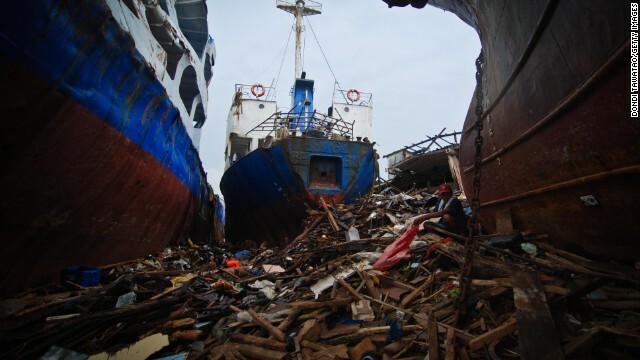 Survivors salvage wood next to stranded ships in Tacloban on November 19. 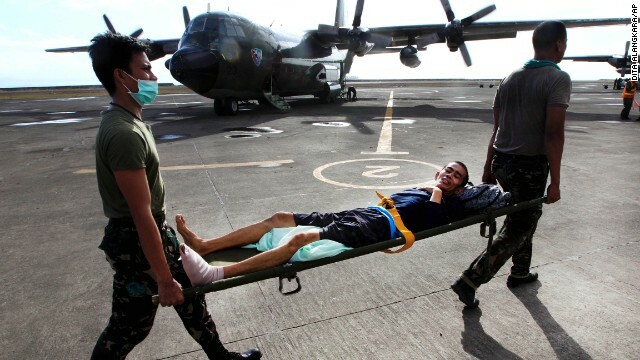 Philippine military personnel carry an injured survivor to an evacuation flight at the Tacloban airport November 19. 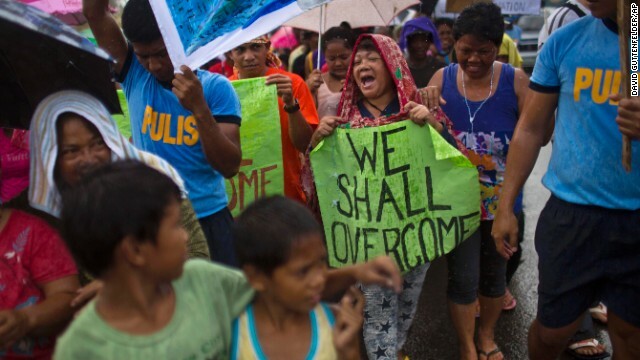 People in Tacloban march in the rain November 19 during a procession calling for courage and resilience among survivors. 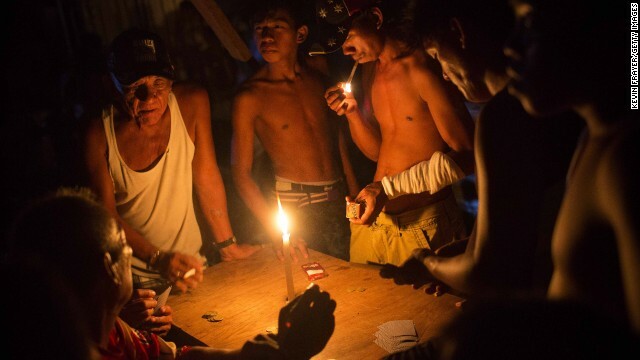 People play cards by candlelight Monday, November 18, in Tacloban. A U.S. Navy helicopter delivers relief goods to typhoon victims in Ormoc, Philippines, on November 18. 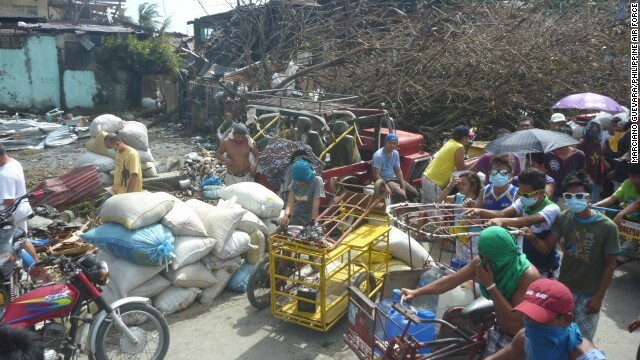 Men take food back to their families in Leyte on November 18. 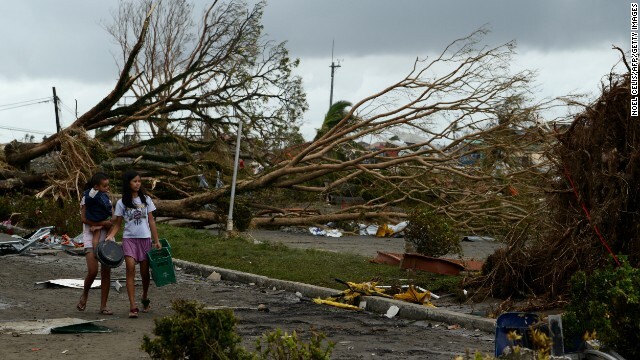 Countries all over the world have pledged relief aid to those affected by the typhoon, but damage to airports and roads have made moving the aid very difficult. 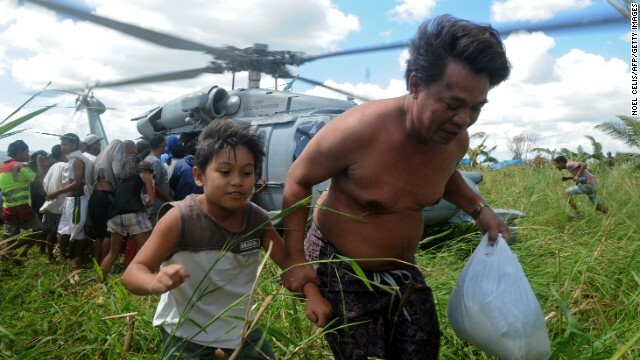 People are held back as the U.S. Navy delivers aid from a helicopter in San Jose, Philippines, on November 18. 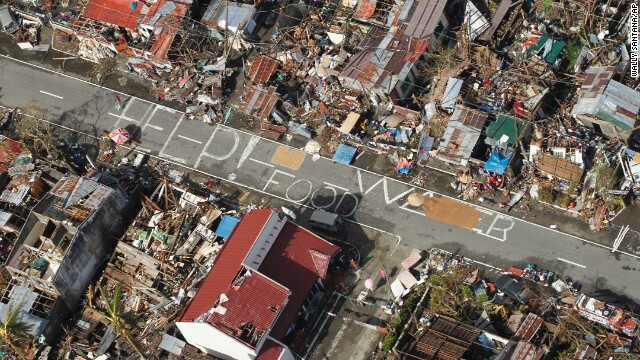 A helicopter flies over a call for help in Ormoc on November 18. 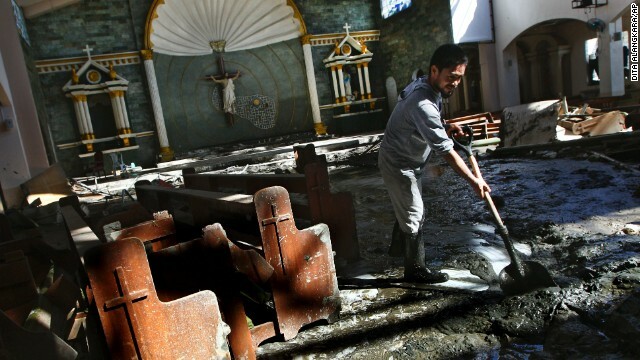 A man cleans up mud inside a church in the hard-hit city of Tacloban on November 18. 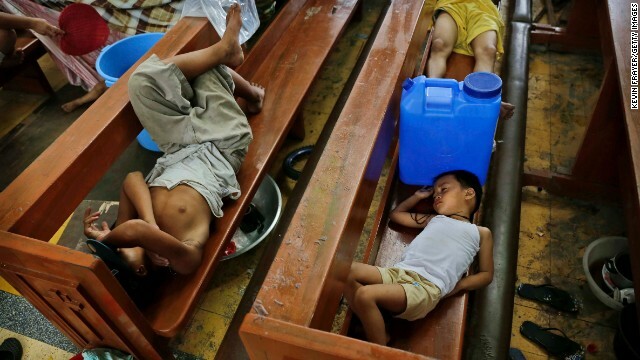 A boy bathes November 18 at a Tacloban school turned into a temporary shelter. 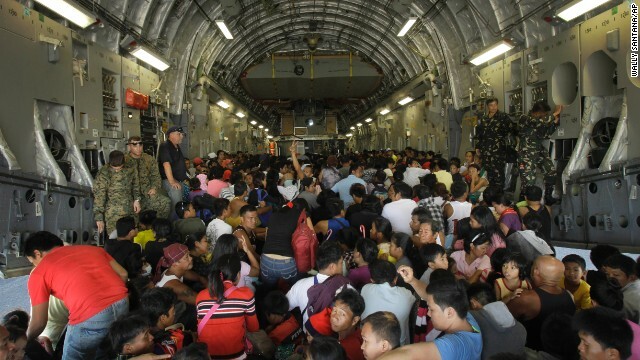 Hundreds of typhoon survivors are packed into a U.S. military airplane November 18 for evacuation from Tacloban's airport. Typhoon survivors run toward a passing U.S. Navy helicopter in San Jose on November 18. A boy holding a toy machine gun sits Sunday, November 17, on a ship that ran aground in Tacloban. 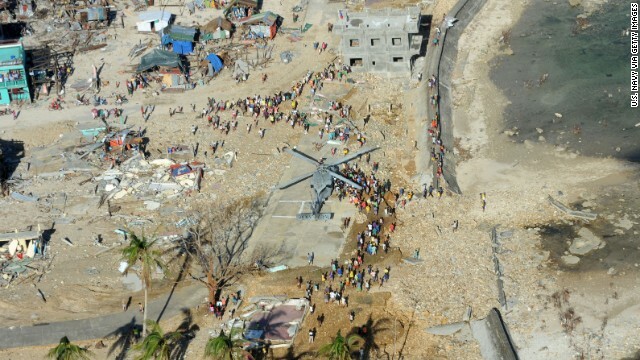 People gather around a helicopter as it delivers relief supplies November 17 in Guiuan, Philippines. 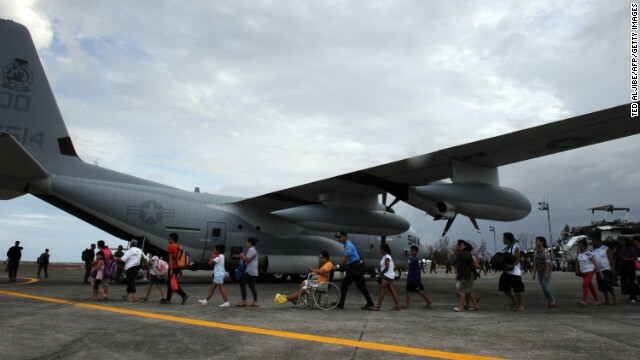 Filipinos board an HC-130 Hercules airplane as U.S. sailors carry relief supplies November 17 in Guiuan. 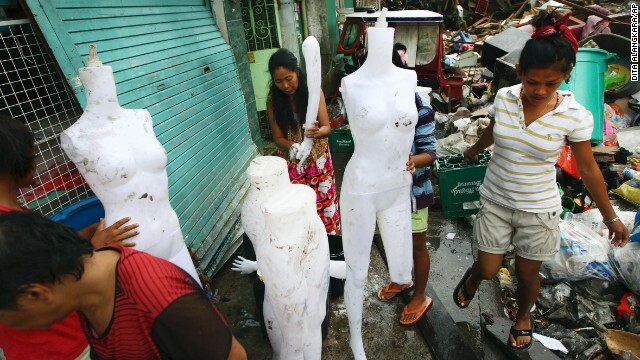 Survivors clean mannequins found among the debris in Tacloban on November 17. 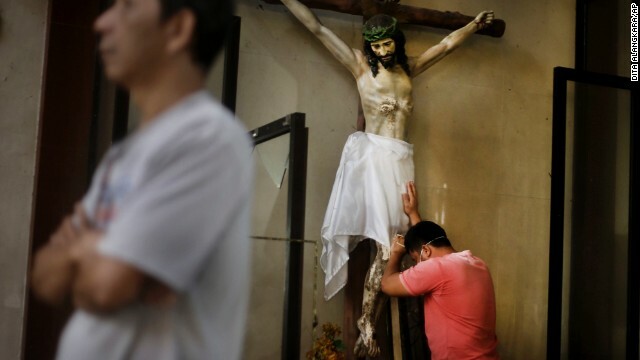 A man leans against a statue of the Crucifixion before a Mass at Santo Nino Church in Tacloban on November 17. 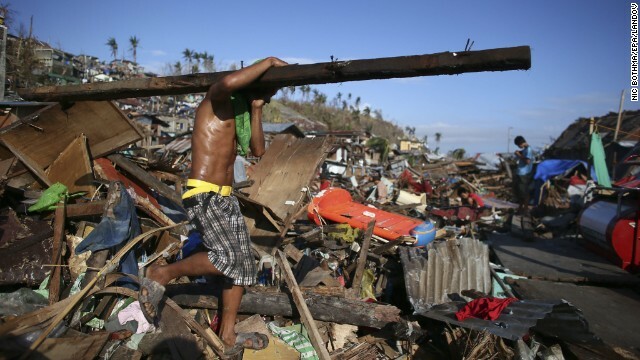 A man carries a piece of wood from the debris in Tacloban on November 17. 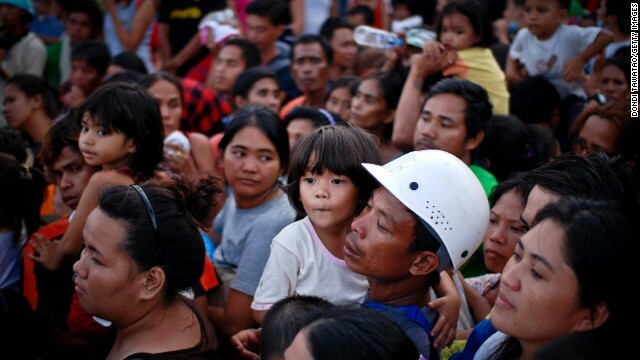 Survivors wait in line in Tacloban for relief goods on November 17. 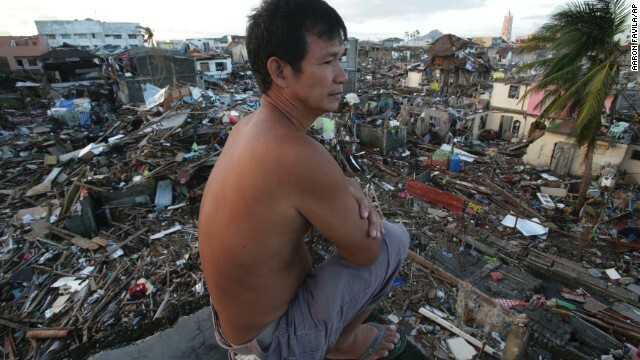 A man looks over the devastation from his damaged home in Tacloban on November 17. 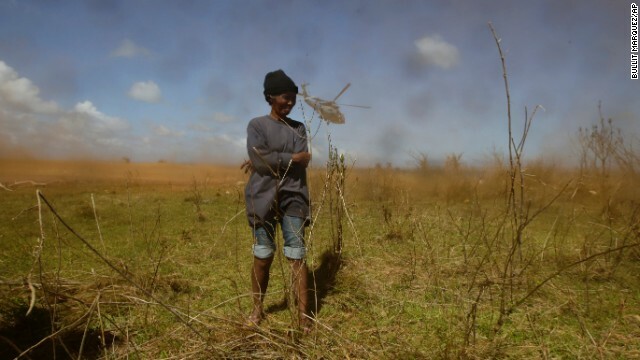 A trapped resident braves the dust created by a U.S. Navy helicopter taking off Saturday, November 16, on Manicani Island, Philippines. 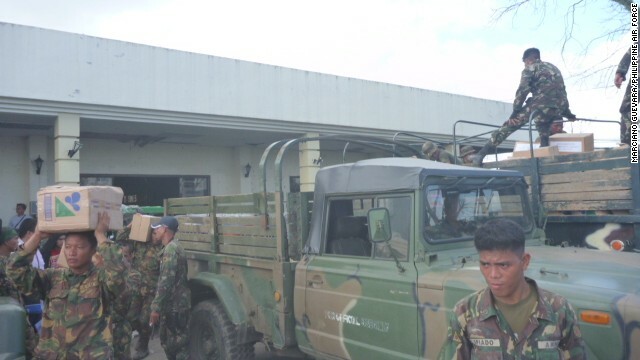 Corpses are collected and loaded on trucks to be taken to mass graves in Tacloban on November 16. 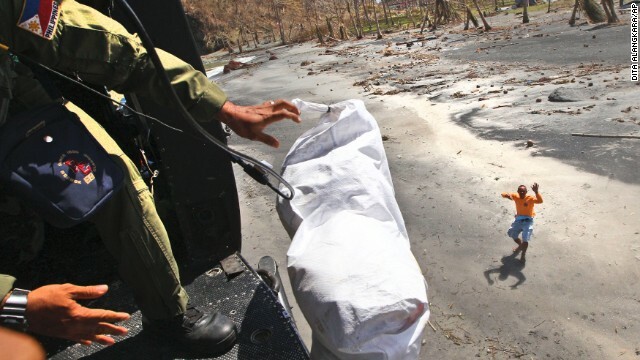 A victim's corpse floats on a river in Tanauan on November 16. 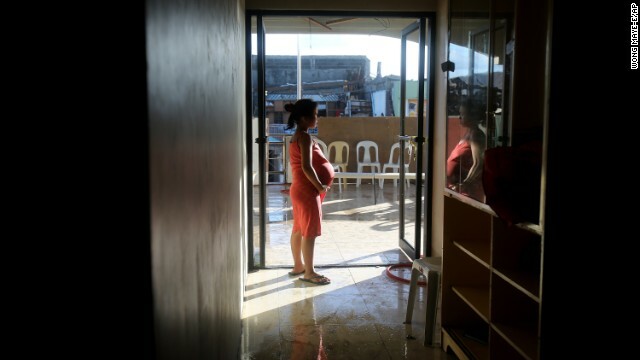 A pregnant survivor waits to give birth in a hospital November 16 in Tanauan. 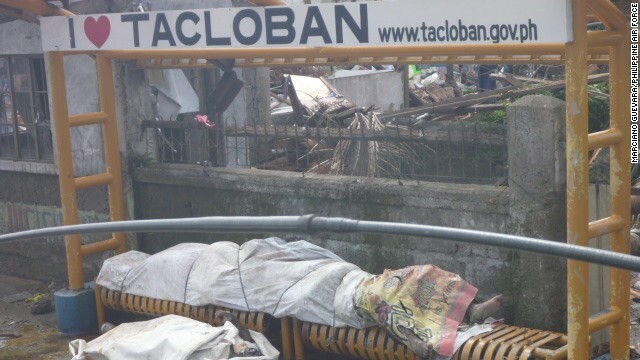 A dead dog lies in front of a house destroyed by the typhoon in Tanauan. A man carries a bicycle as he walks through the ruins of a Tacloban building November 16. 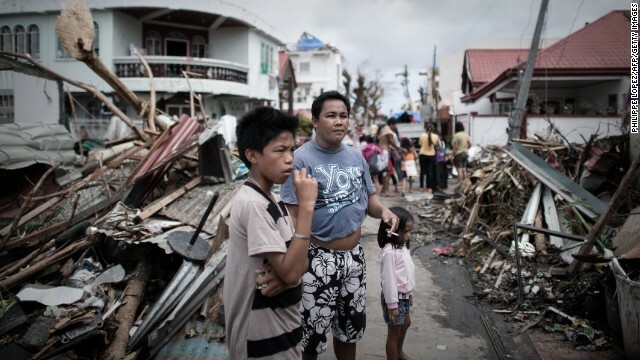 Survivors of the typhoon stand in a Tanauan street partially blocked by debris November 16. An elderly survivor walks past toppled cars outside a church in Tacloban on November 16. 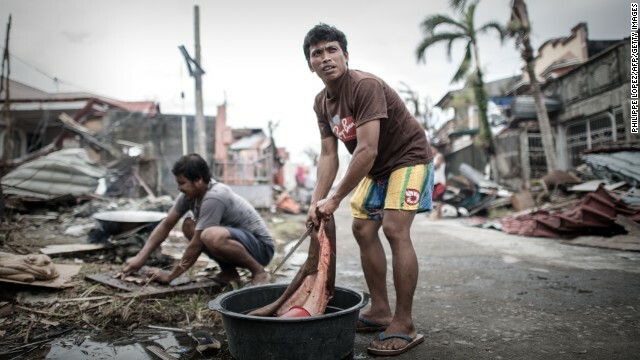 A man in Tanauan cleans meat after slaughtering his only cow that survived the typhoon. 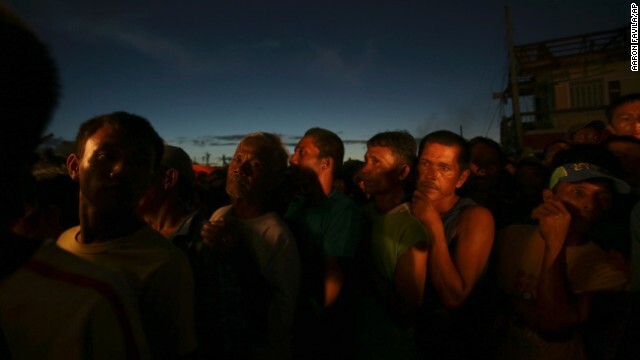 Survivors gather in Tacloban to await transport to a neighboring province on November 16. 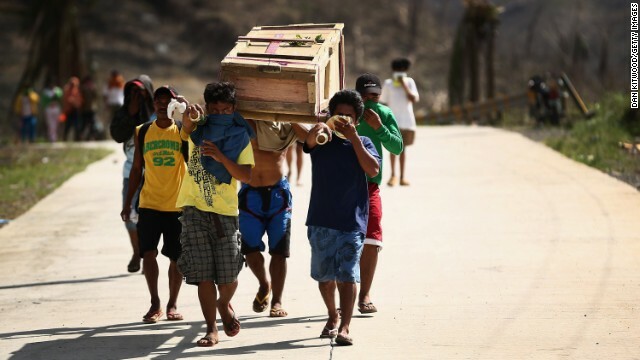 Men carry a coffin toward a Leyte cemetery on November 16. 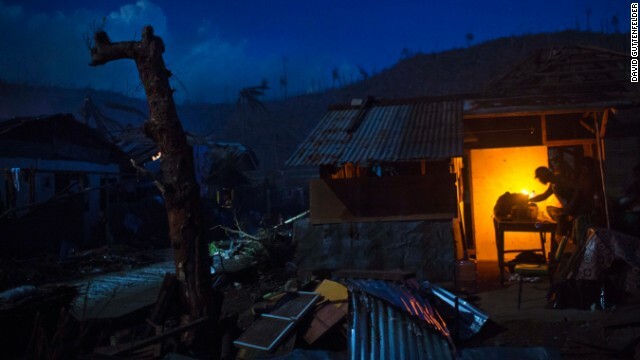 A survivor cooks dinner in front of his damaged home in Marabut, Philippines, on Friday, November 15. 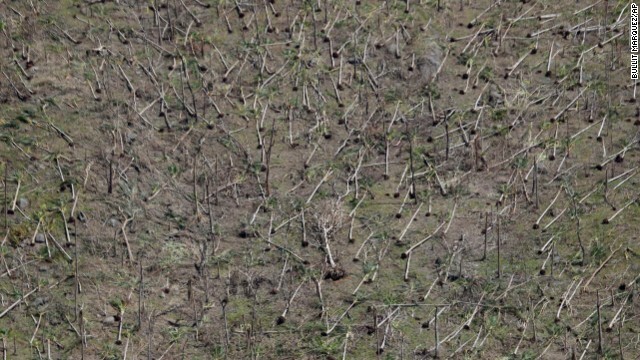 Toppled coconut trees dot a mountain in an area devastated by the typhoon in Leyte province. 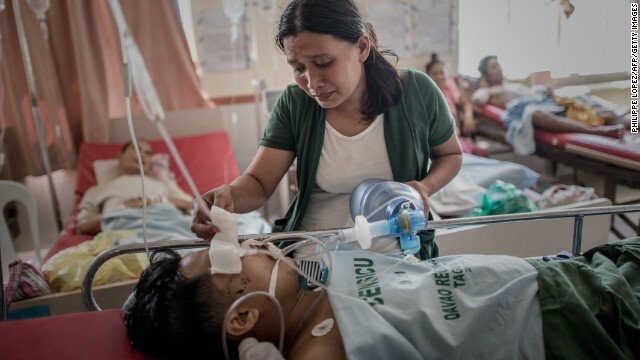 A typhoon survivor keeps her husband alive by manually pumping air into his lungs after his leg was amputated at a Tacloban hospital November 15. The hospital has been operating without power since the typhoon. 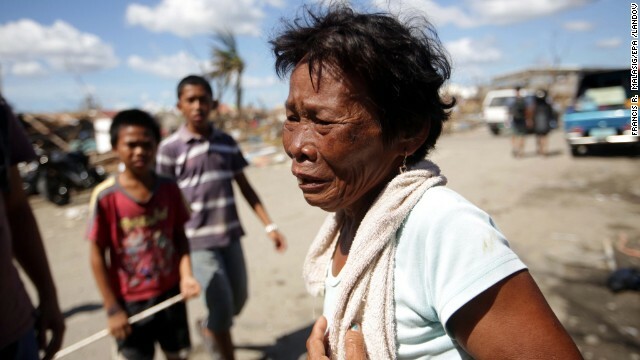 A survivor reacts to the damage at a residential area in Tacloban on November 15. 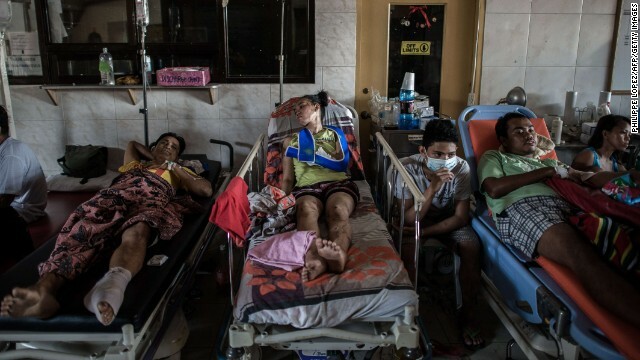 Typhoon victims are treated in the lobby of a Tacloban hospital on November 15. Philippine Army soldiers carry the body of a civilian in Tanauan on November 15. 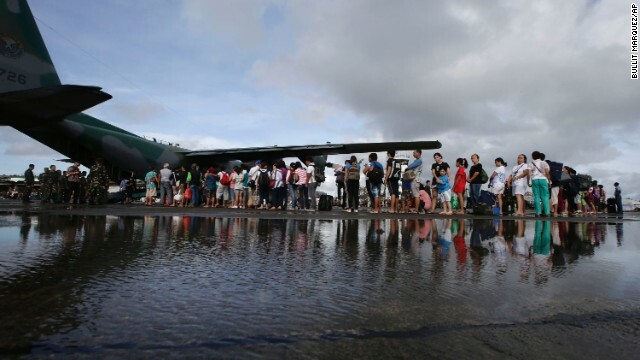 Residents wait to board a Singaporean cargo plane at the Tacloban airport on November 15. Many survivors have converged on the city's airport to wait for flights. 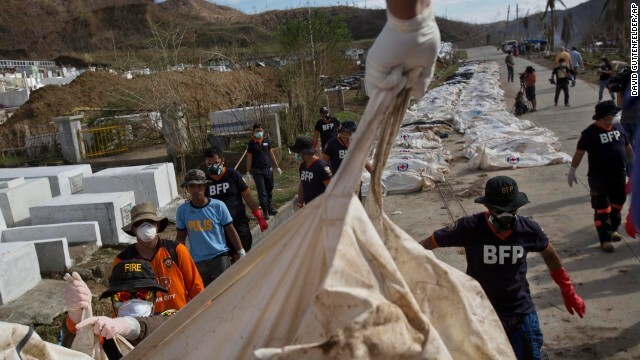 Search and retrieval teams carry a body bag in Tacloban on November 15. Haiyan survivors carry food that a U.S. military helicopter dropped off in Guiuan on Thursday, November 14. 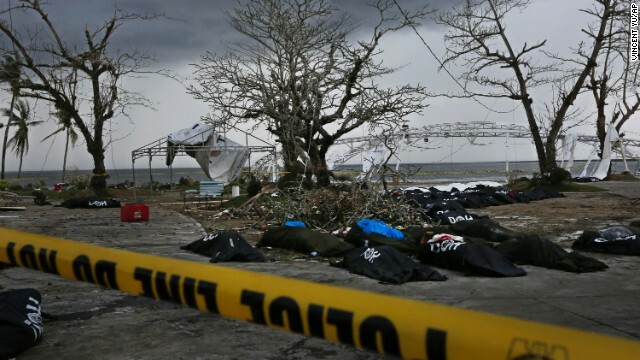 Dozens of bodies are placed near Tacloban City Hall on November 14 as workers prepare a mass grave on the outskirts of the hard-hit city. 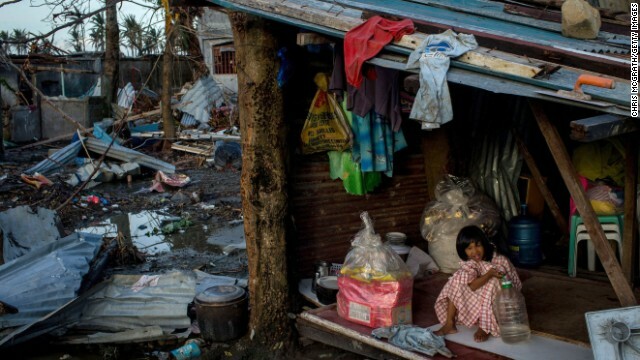 A girl plays inside her house amid the devastation in Tacloban on November 14. 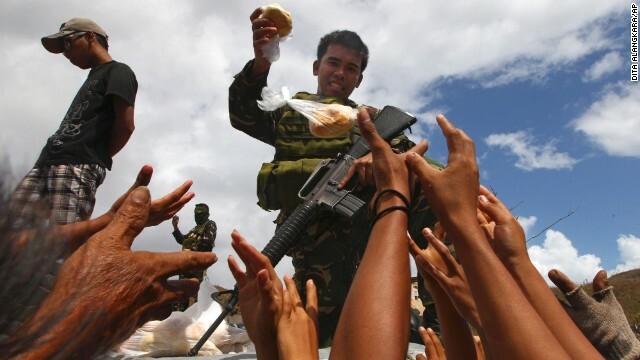 A Filipino soldier hands out bread to survivors in Maraboth, Philippines, on November 14. 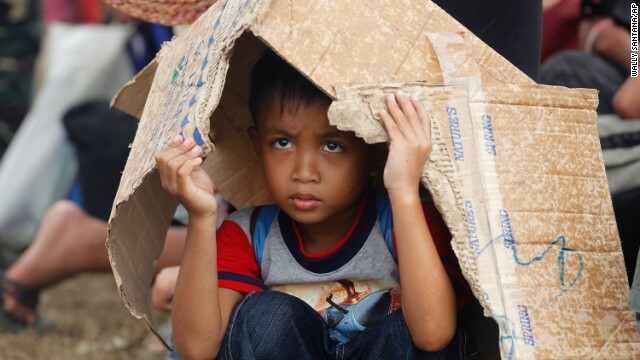 A boy takes cover from rain while waiting for an evacuation flight from Tacloban's airport November 14. 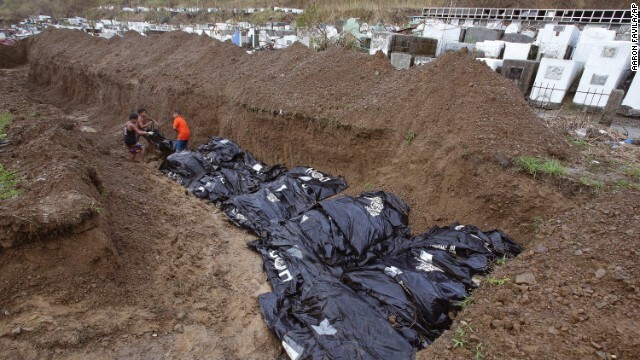 Workers arrange bodies at a mass burial site at a Tacloban cemetery November 14. The weary wait for evacuation from Tacloban on November 14. 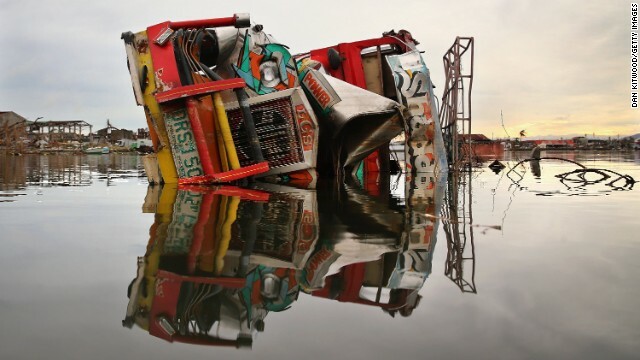 A truck lies in the water in Hernani, Philippines, on November 14. 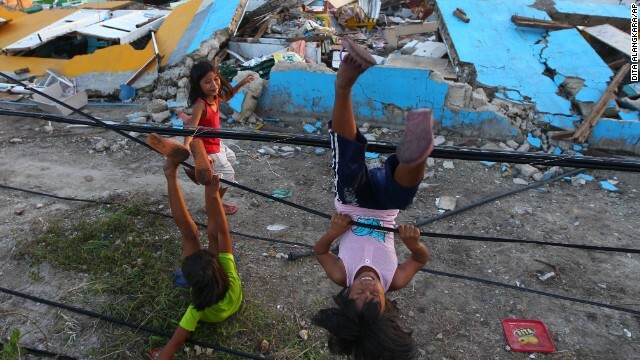 Children play with fallen power lines near a damaged school in Guiuan on November 14. Teresa Mazeda hangs laundry in the ruins of her Tacloban home on Wednesday, November 13. 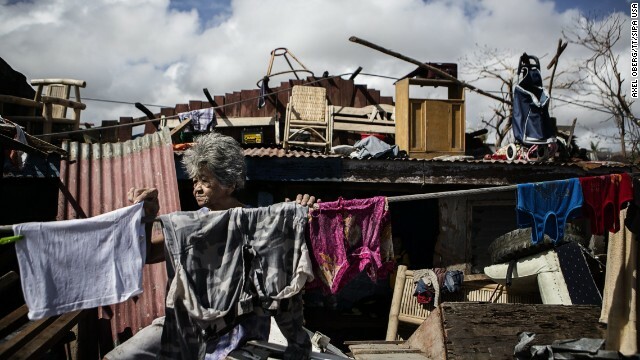 Nina Duran searches for belongings at her family's destroyed house in Tacloban on November 13. 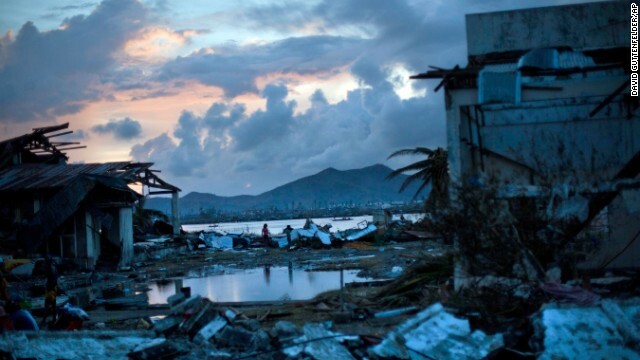 Survivors walk through the ruins of their neighborhood outside Tacloban on November 13. 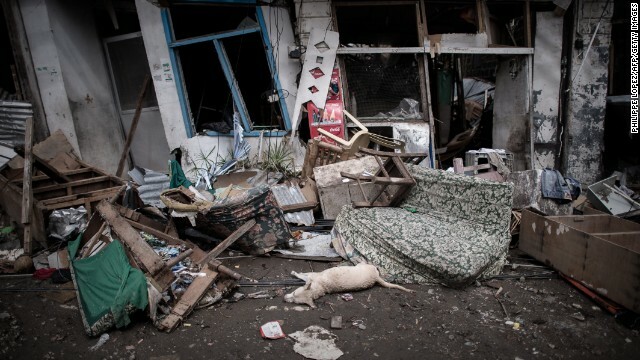 A man sits in front of his destroyed business November 13 in Tacloban. 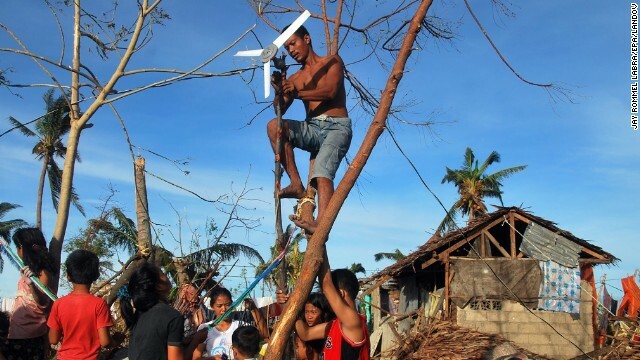 A family, desperate to charge their mobile phones to search for family and friends, tries to use a ceiling fan to generate electricity November 13 in the Philippine province of Cebu. 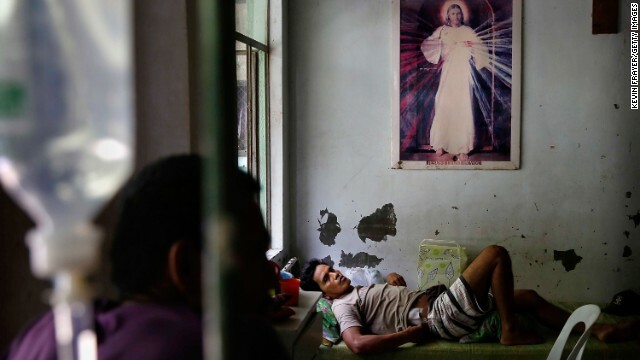 An injured man in Tacloban rests beneath a picture of Jesus Christ on November 13. 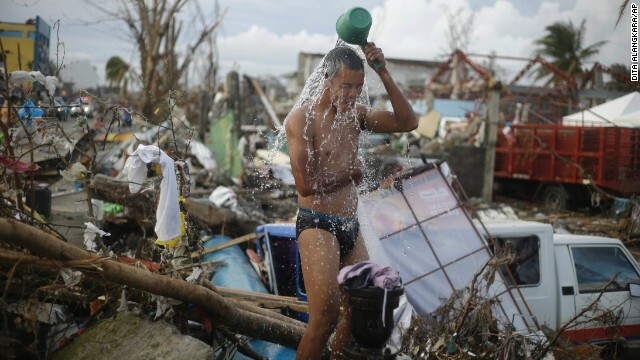 A man takes a shower amid the rubble in Tacloban on November 13. 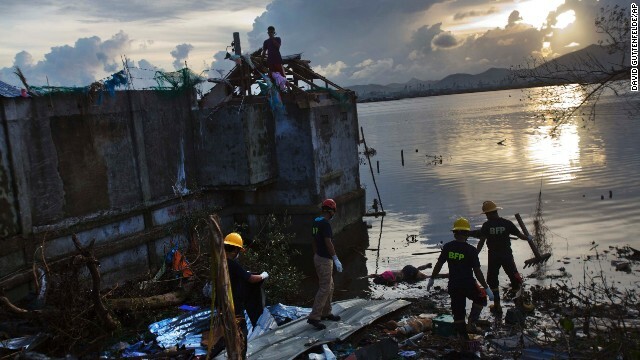 A rescue team wades into Tacloban floodwater to retrieve a body on November 13. Residents take shelter in a Tacloban church on November 13. 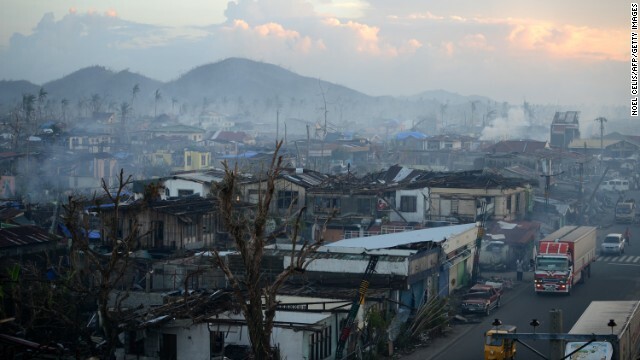 Residents make their way through a destroyed neighborhood in Tacloban on November 13. 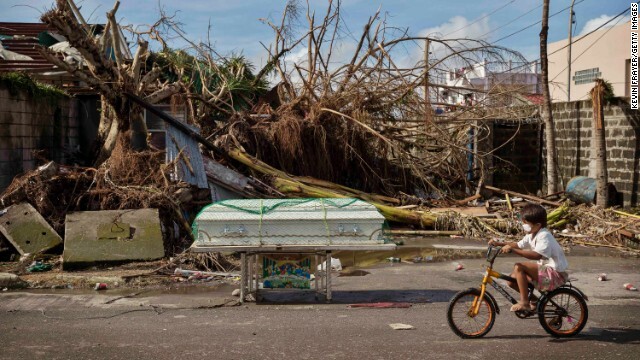 A boy cycles past a coffin left on a street in Tacloban on November 13. 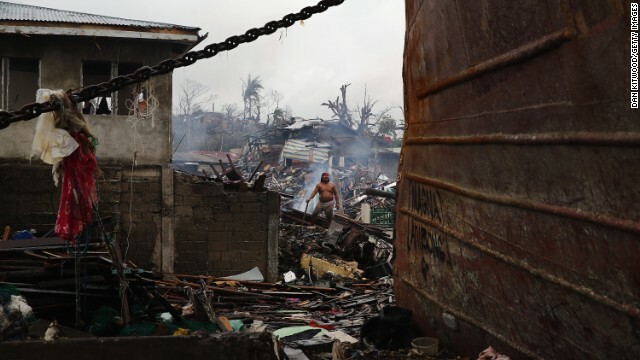 A man looks at his destroyed home November 13 in Tacloban. 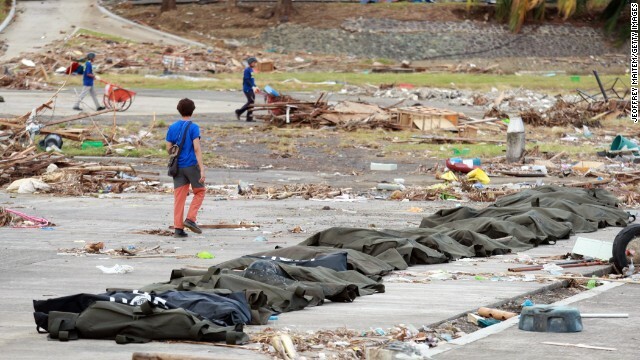 Body bags are lined up in Tacloban on November 13. Survivors prepare to board a military plane November 13 at the Tacloban airport. 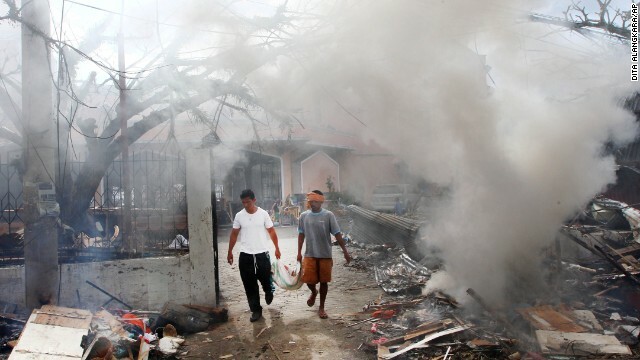 Men walk through smoke as they burn debris from a Tacloban church on November 16. 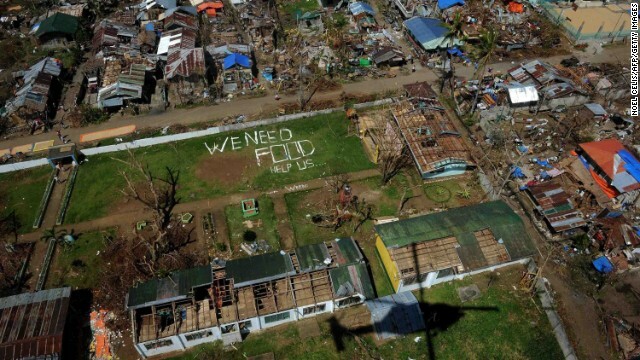 An aerial view of Tanuan shows signs pleading for help and food November 13. 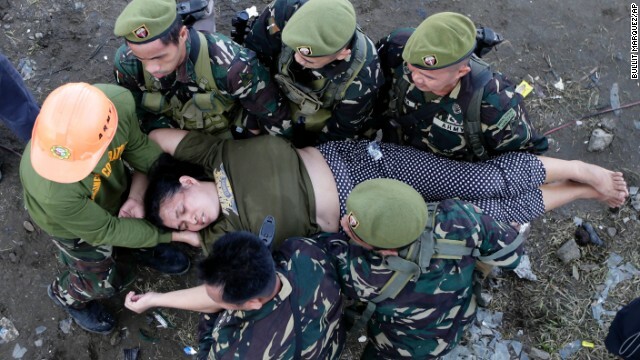 Soldiers help a woman after she collapsed November 13 while waiting in line to board a military plane at Tacloban's airport. 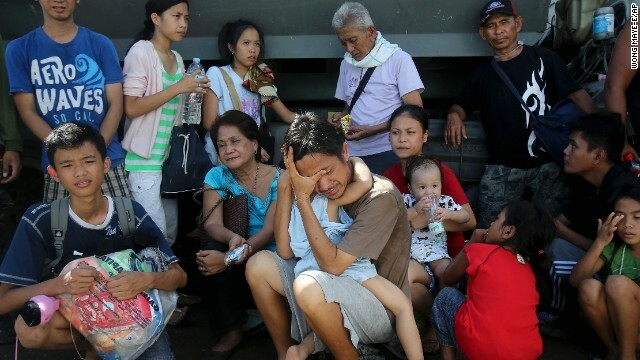 Survivors wait to be evacuated from Tacloban on November 13. 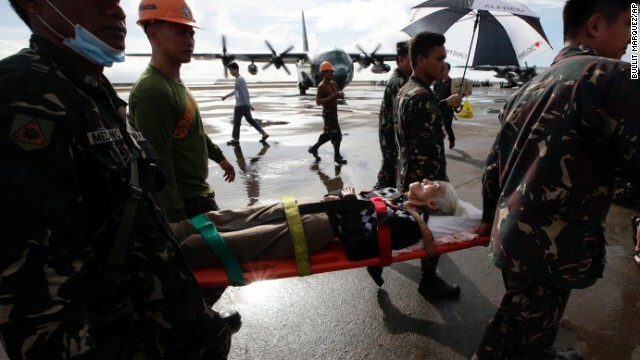 An injured survivor gets carried on a stretcher before being airlifted from Tacloban's airport November 13. 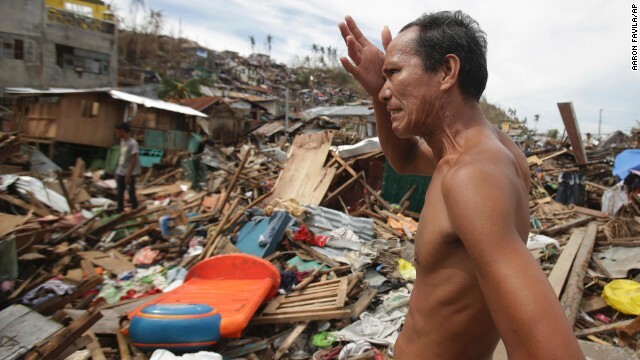 A survivor begins to rebuild his house in Tacloban on November 13. 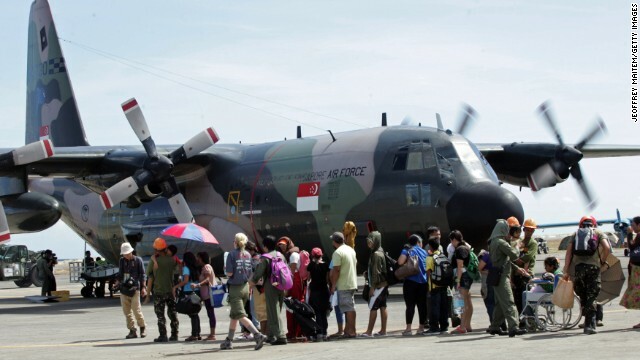 Evacuees wait to board a military aircraft in Leyte on Tuesday, November 12. 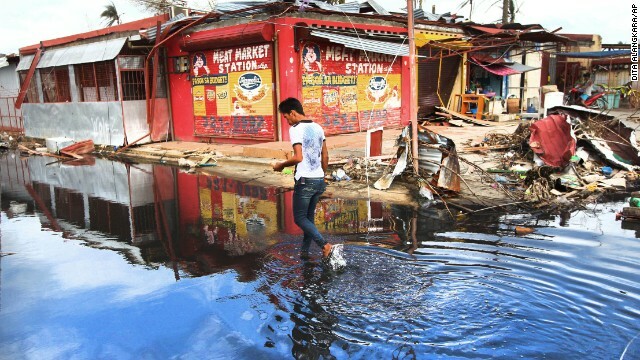 People walk through damage in Tacloban on November 12. 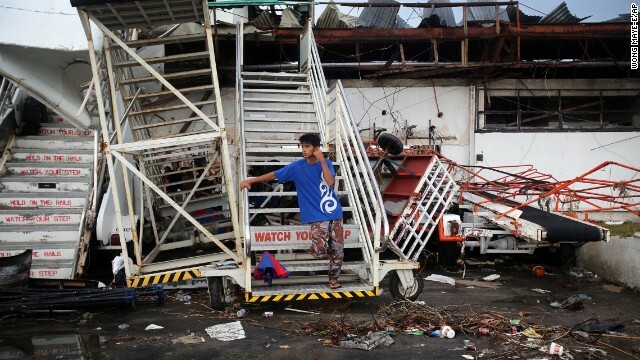 A young man waits at the airport November 12 in hopes of being evacuated from Tacloban. A woman comforts a crying relative as a plane leaves the Tacloban airport November 12. 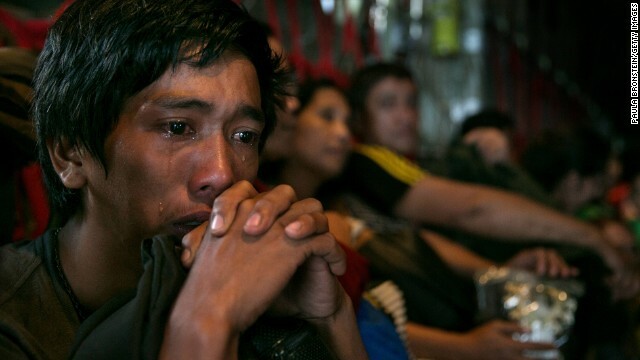 A man sits crying on a packed aircraft in Tacloban on November 12. 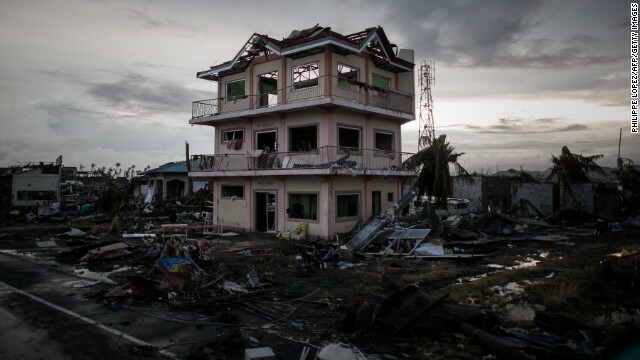 Debris lays scattered around a damaged home near the Tacloban airport on November 12. 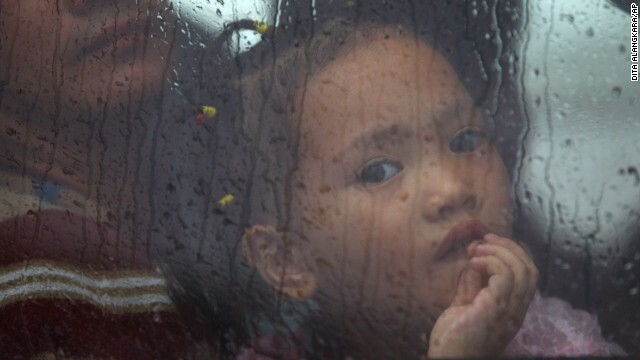 A girl sits inside a bus as she waits for a ferry in Matnog, Philippines, on November 12. 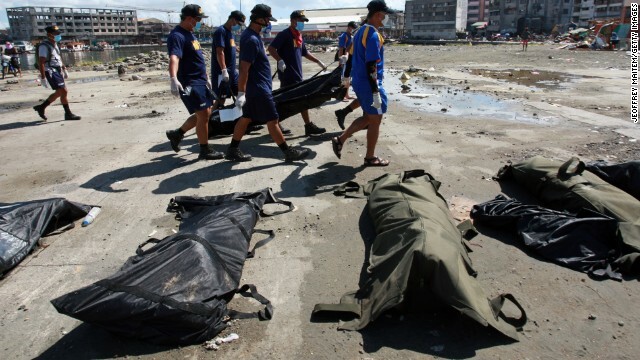 Police line up bodies for processing in Tacloban on November 12. 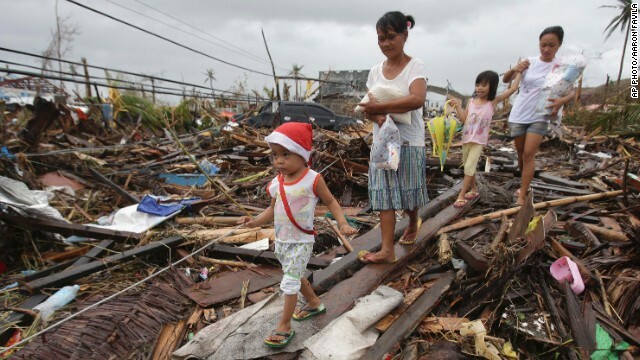 People in Tacloban pass debris on November 11. Survivors in Tacloban board a military plane bound for the Philippine capital of Manila on November 11. Residents carry bags of rice from a Tacloban warehouse that they stormed November 11 because of a food shortage. 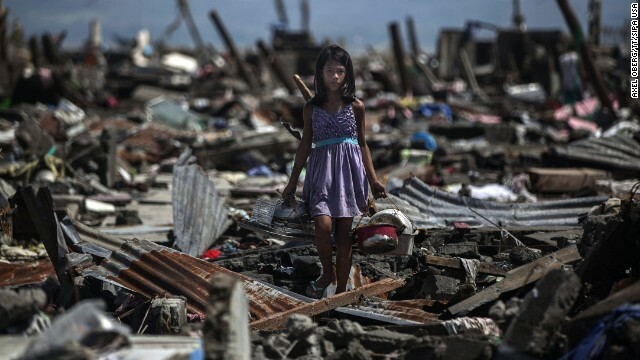 A woman in Tacloban walks amid the debris of destroyed houses on November 11. People make their way across a flooded street in Shangsi, China, on November 11. 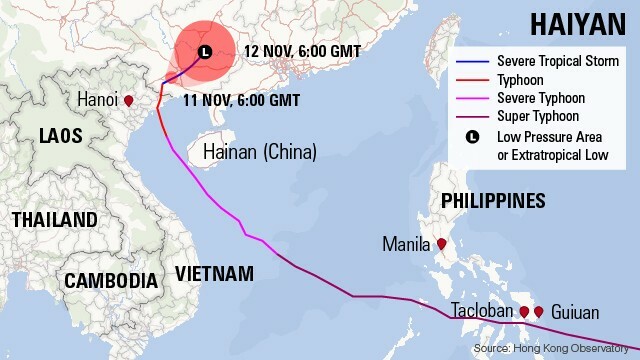 Haiyan moved toward Vietnam and south China after devastating the Philippines. Buildings lie in ruins on Eastern Samar's Victory Island. 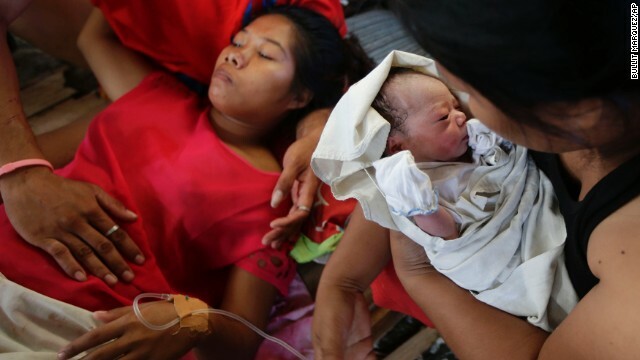 Emily Ortega rests on November 11 after giving birth to Bea Joy at an improvised clinic at the Tacloban airport. 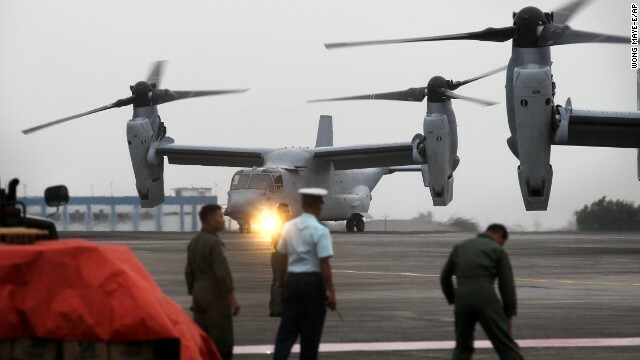 U.S. Marine Corps Osprey aircraft arrive at Manila's Villamor Airbase to deliver humanitarian aid on November 11. 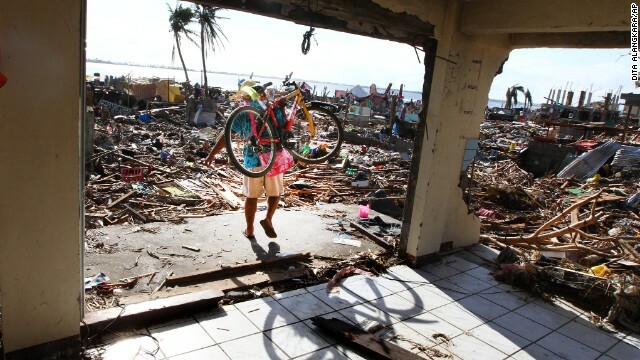 People ride past destruction in Tacloban on Sunday, November 10. 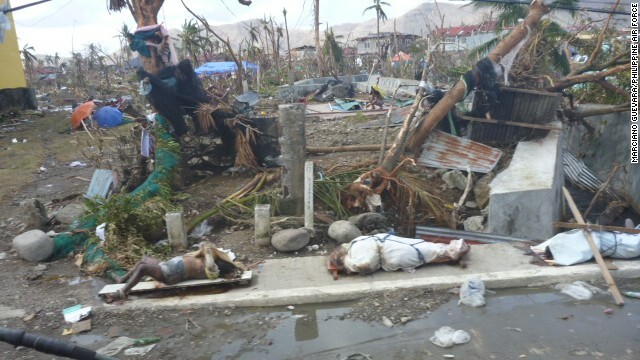 A body lies amid the Tacloban devastation on November 10. People cover their noses to block the smell of bodies in Tacloban on November 10. 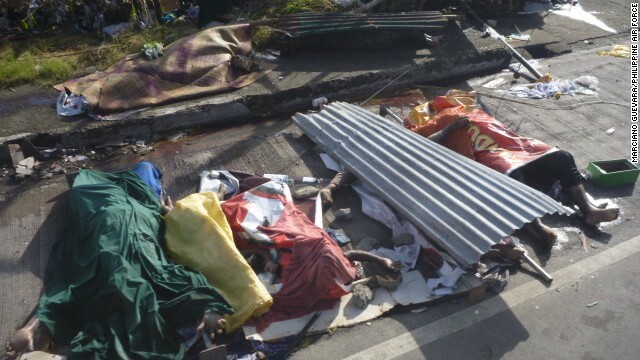 Bodies of victims lie along a Tacloban road on November 10. 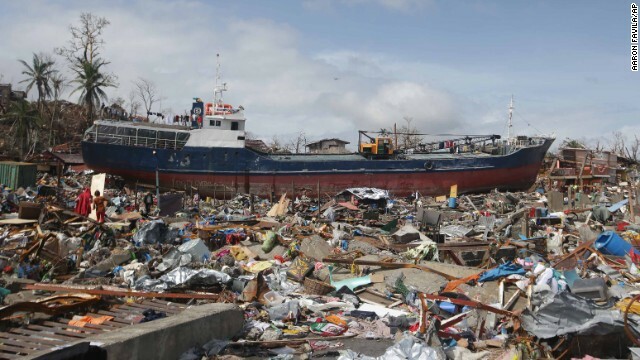 A large boat sits aground, surrounded by debris in Tacloban on November 10. 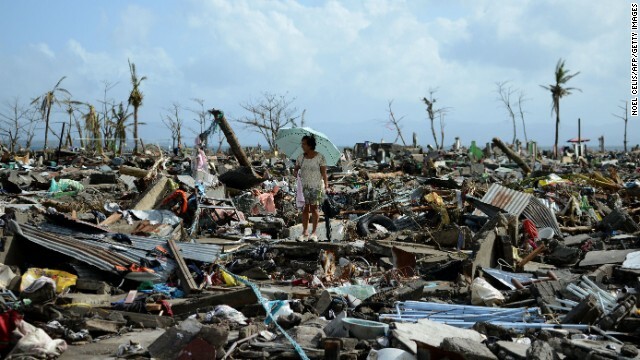 People walk past the Tacloban devastation on November 10. 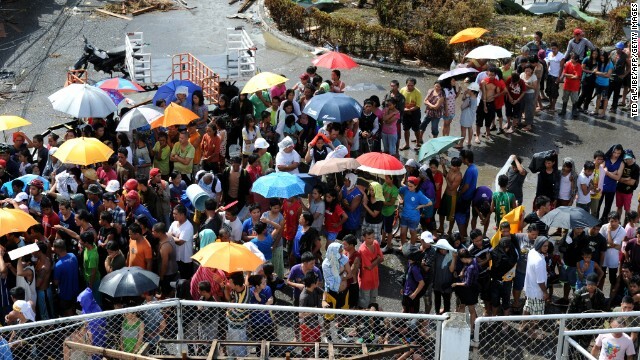 People stand under a shelter in Tacloban. 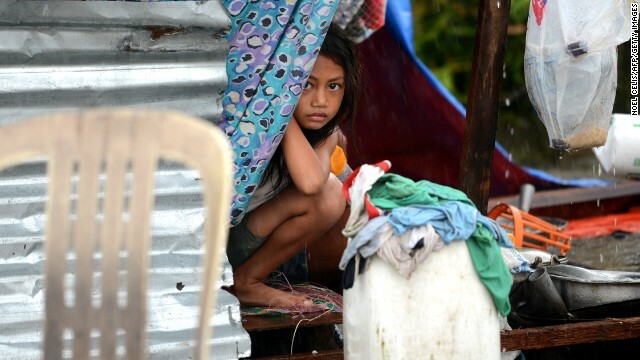 A girl peeks out from a makeshift shelter in Tacloban. 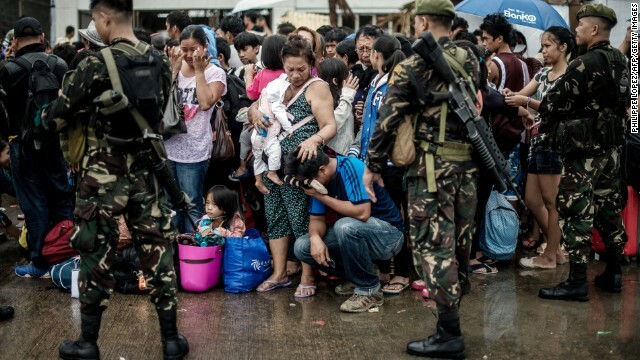 Typhoon survivors wait to receive relief goods at the Tacloban airport on November 10. 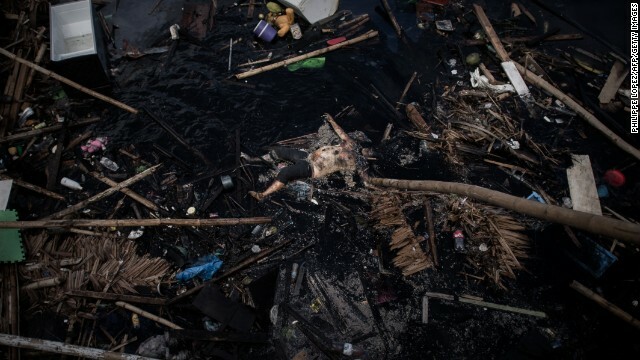 A woman mourns in front of her husband's dead body November 10 in Tacloban. Fallen trees litter the ground at the Tacloban airport on Saturday, November 9. 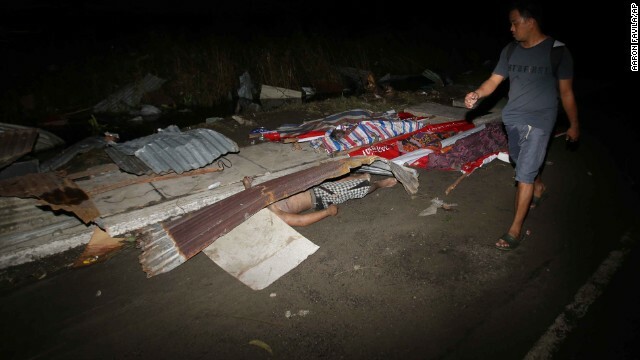 A resident passes victims' bodies on a Tacloban street November 9. 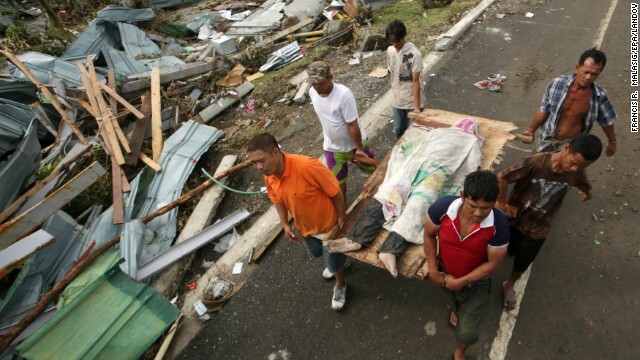 People in Tacloban carry a victim of the typhoon November 9. 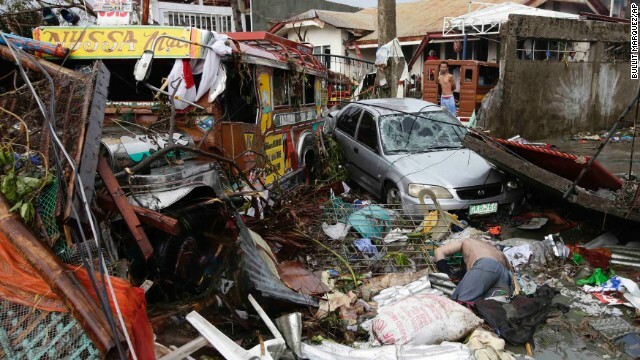 A vehicle lies amid Tacloban debris on November 9. 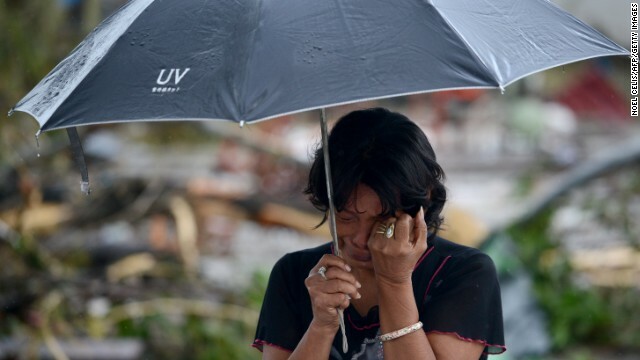 People walk past a victim left on the side of a road in Tacloban. 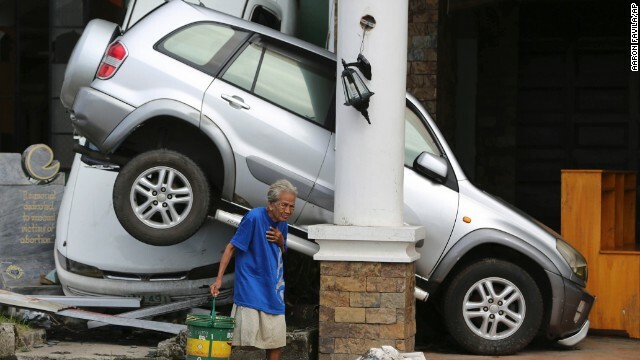 A resident passes an overturned car in Tacloban on November 9. 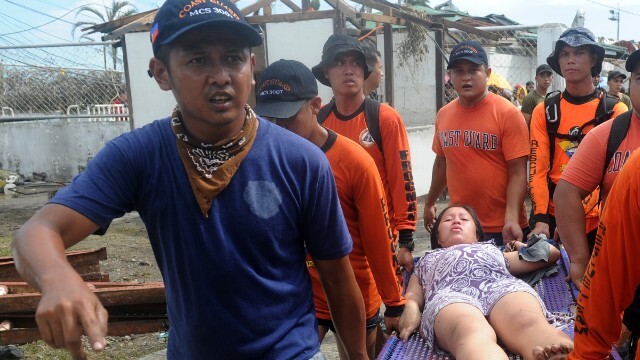 Rescue workers carry a woman about to give birth November 9 at a makeshift medical center at the Tacloban airport. 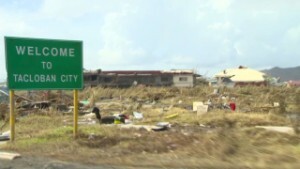 An airport lies in ruins in Tacloban. 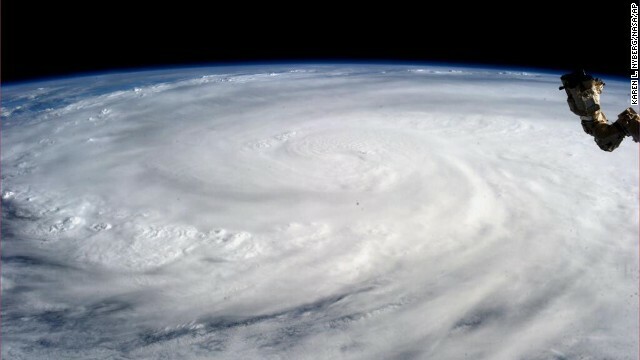 Astronaut Karen L. Nyberg took a picture of the typhoon from the International Space Station on November 9. 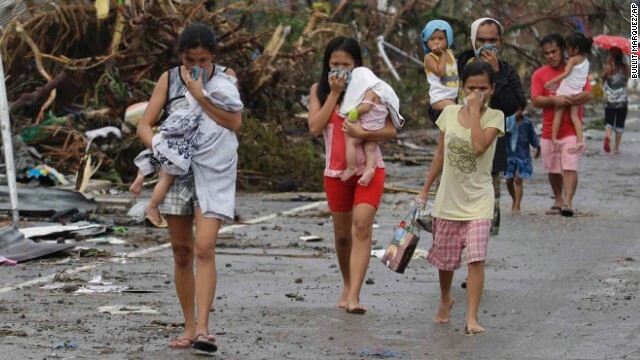 Women walk past fallen trees and destroyed houses in Tacloban on November 9. Residents scoured supermarkets for water and food as they slowly emerged on streets littered with debris. 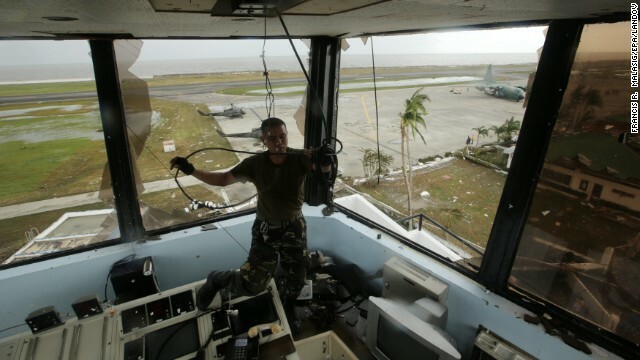 A soldier pulls a cable inside the devastated airport tower in Tacloban. 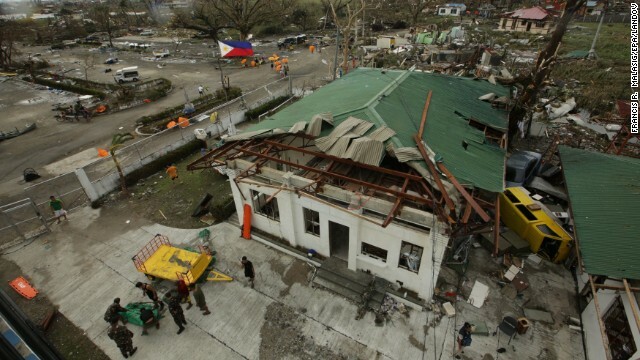 Tacloban houses are destroyed by the strong winds caused by the typhoon. 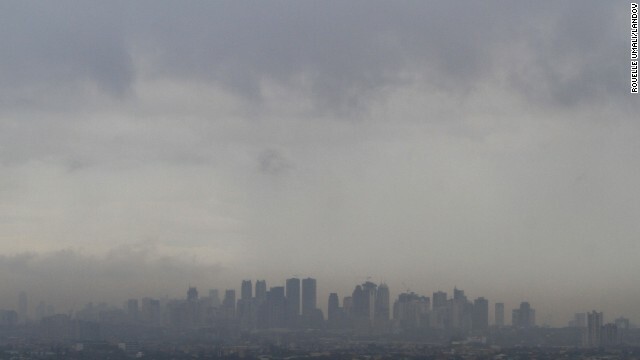 Dark clouds brought by Haiyan loom over Manila skyscrapers on November 8. 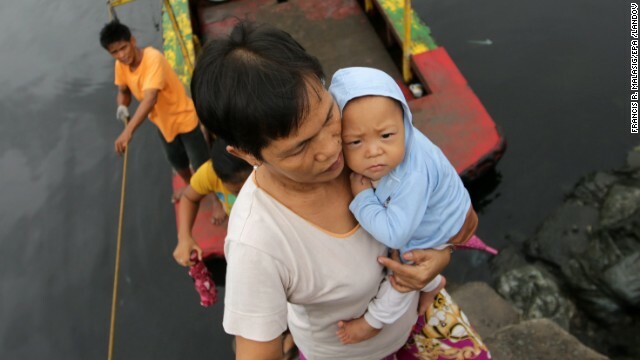 A woman carries a baby across a river November 8 at a coastal village in Las Pinas, Philippines. 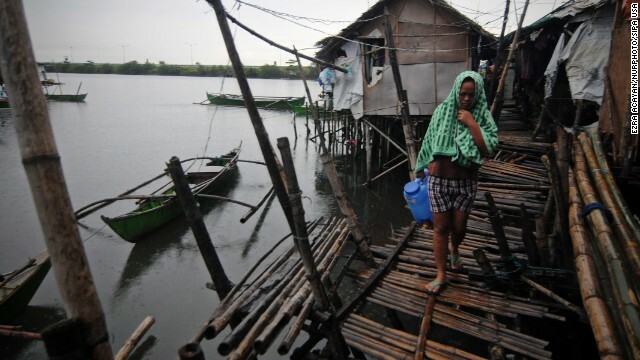 A resident walks along a fishing village in Bacoor, Philippines, on November 8. 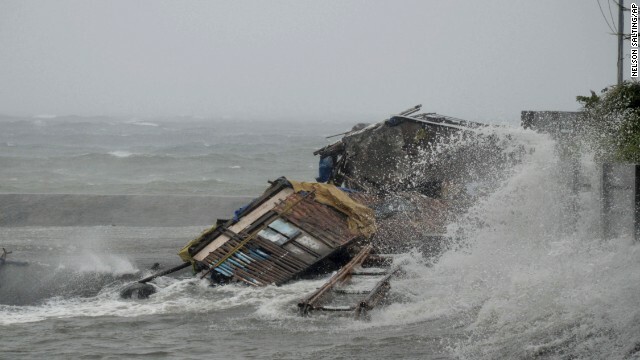 A house in Legazpi, Philippines, is engulfed by storm surge November 8. 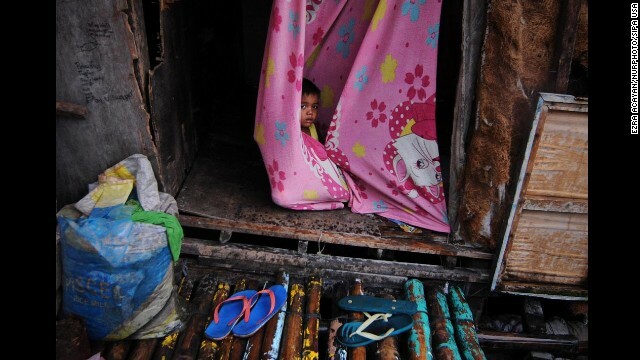 A child wraps himself in a blanket inside a makeshift house along a Bacoor fishing village. 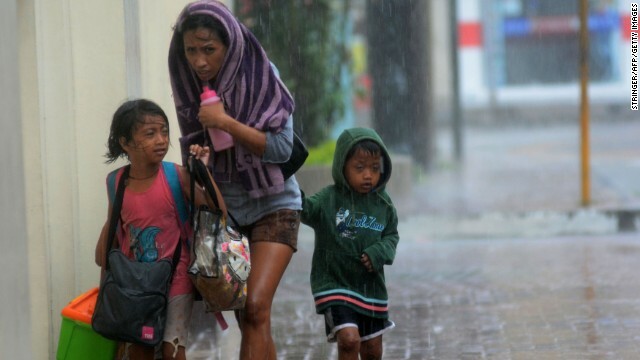 A woman and her children head for an evacuation center November 8 amid strong winds in Cebu City, Philippines. 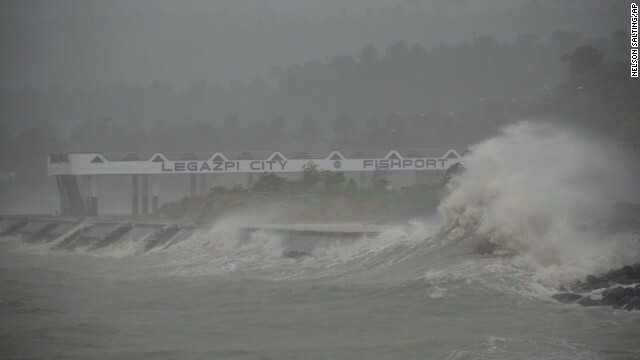 Huge waves from Haiyan hit the shoreline in Legazpi on November 8. 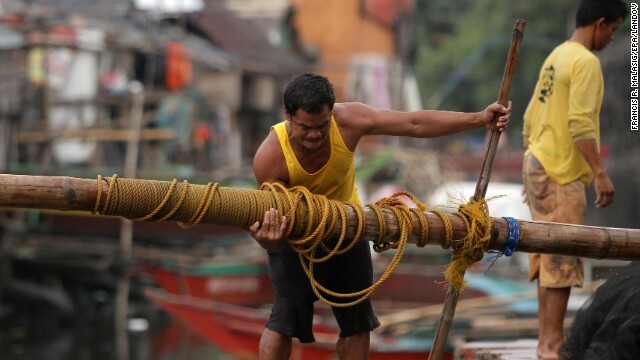 A fisherman lifts a post to reinforce his home at a coastal village in Las Pinas on November 8. 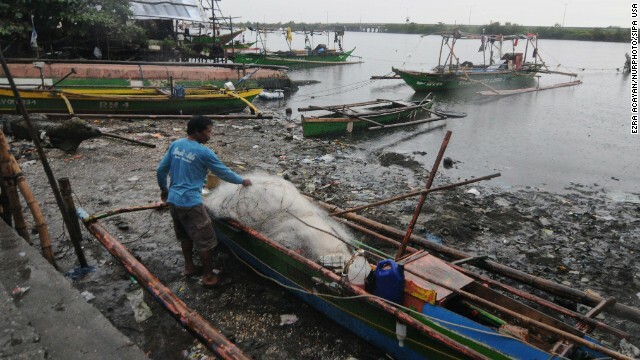 A resident unloads nets off a fishing boat in Bacoor on November 8. 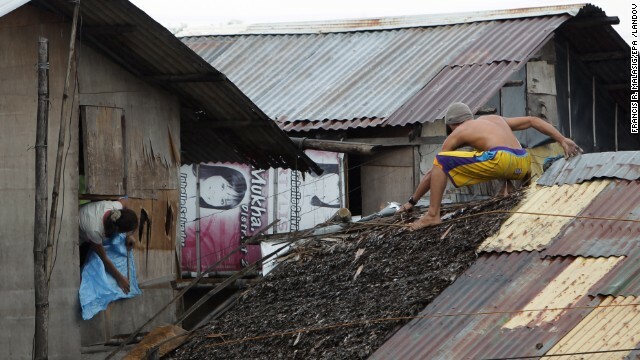 Residents reinforce their homes in Las Pinas on November 8. 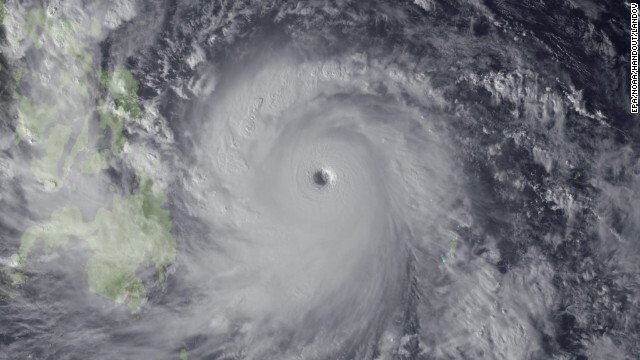 The storm approaches the Philippines in this satellite image taken Thursday, November 7, by the National Oceanic and Atmospheric Administration. 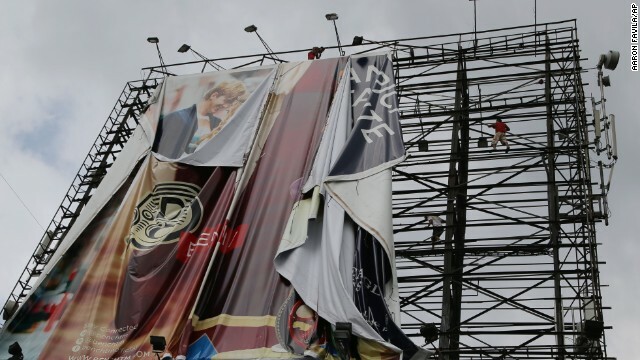 Workers bring down a billboard in Makati, Philippines, on November 7 before Haiyan makes landfall. 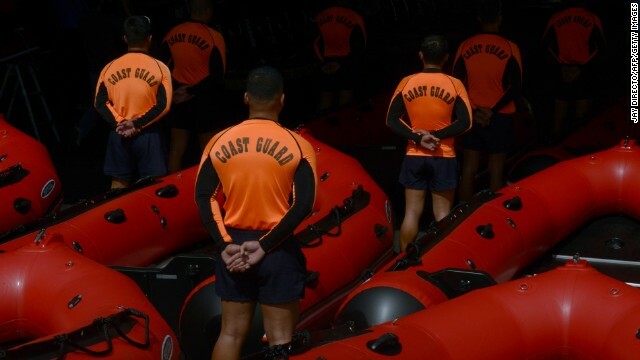 Philippine Coast Guard personnel stand in formation beside newly acquired rubber boats after a blessing ceremony in Manila on Wednesday, November 6. 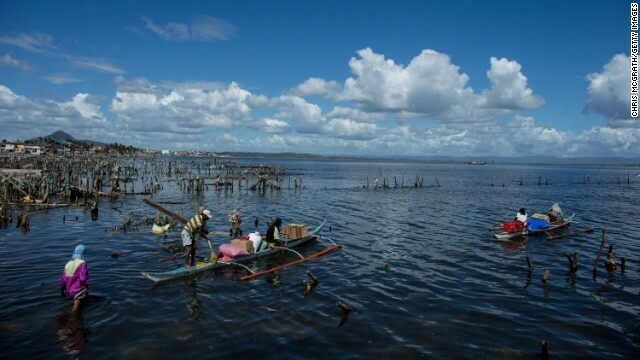 The boats were to be deployed to the central Philippines in preparation for Haiyan. "The whole scene was like something fresh out of a movie. It was like the end of the world," Alcala said. "...Survivors are walking everywhere carrying sacks of goods they were able to get." The lack of food and water drove famished survivors to desperate measures. They've taken food and other items from grocery and department stores in Tacloban, where shop owners have organized to defend their goods with deadly force. Still, little aid was reaching victims, especially those in remote locations. 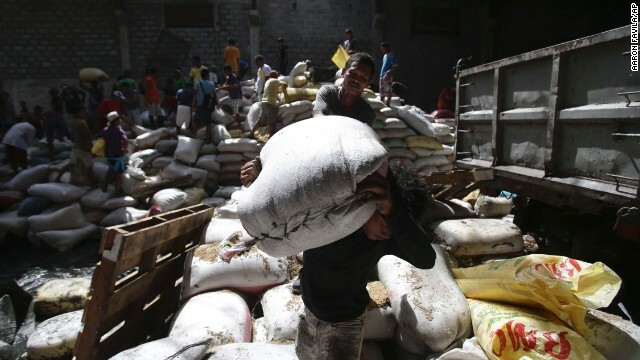 More than 2 million people need food aid, the Philippine government said. 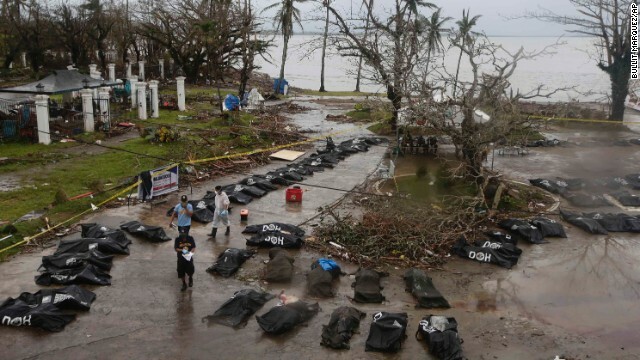 The initial death toll projection of 10,000 was "too much," President Benigno Aquino III told CNN's Christiane Amanpour. He estimated that the final accounting would more likely be around 2,000 to 2,500. 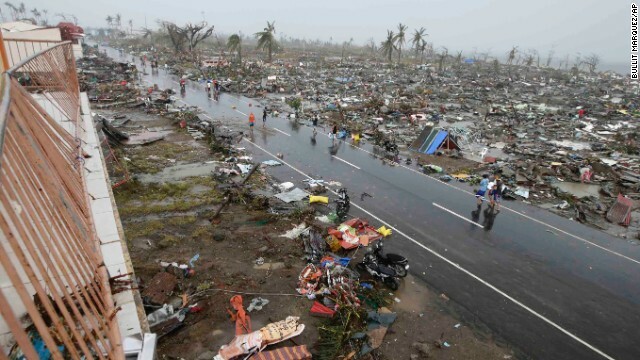 The toll from Typhoon Haiyan -- known in the Philippines as "Yolanda" -- grew to 1,833 dead and 2,623 injured, the National Disaster Risk Reduction and Management Council said Wednesday. At least 84 people are missing, the council said. The number of dead and wounded will likely grow as search and rescue efforts continue. Among the dead, the State Department said Tuesday, were two U.S. citizens. Their identities were not released pending notification of next of kin. 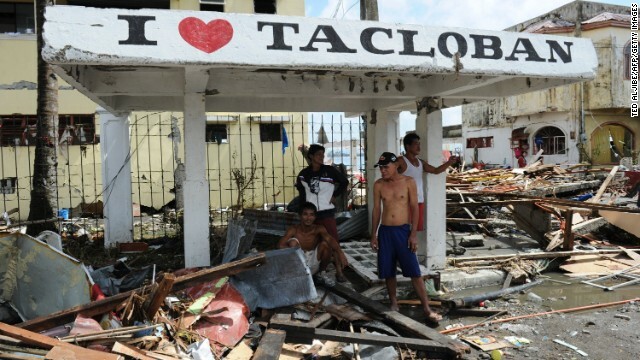 Everybody in Tacloban is searching for somebody. 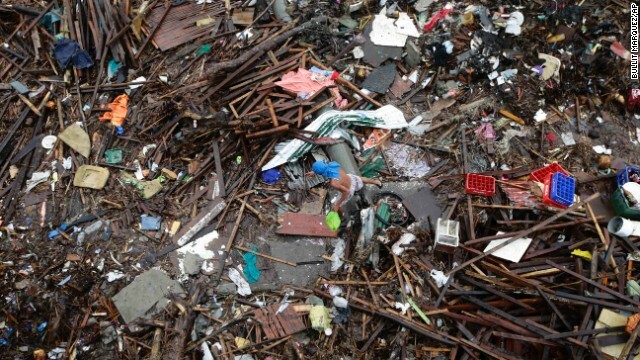 A dog led Yan Chow and a search crew to the body of his daughter buried underneath debris in Tacloban. Chow has been looking for his two children and his wife since the storm hit. He was texting with his daughter when the messages suddenly stopped, about the time a massive storm surge is believed to have hit the city. Her body was found not too far from where they found her brother, some distance from their house, Chow told CNN early Wednesday. The children's mother is believed to be buried somewhere nearby, Chow said. Bodies litter the roads. Some are crudely covered in plastic and sheets, others left out in the blazing sun. Many corpses are out of view, mixed up with the rubble spread out as far as the eye can see. Some of them may be buried inside homes covered by mud and debris. Juan Martinez sits underneath a makeshift shack where his home once stood. Nearby, the bodies of his wife and two children are covered by sacks. "I really want someone to collect their bodies so I know where they are taken," he told CNN's Anderson Cooper. "I want to know where they are taken." 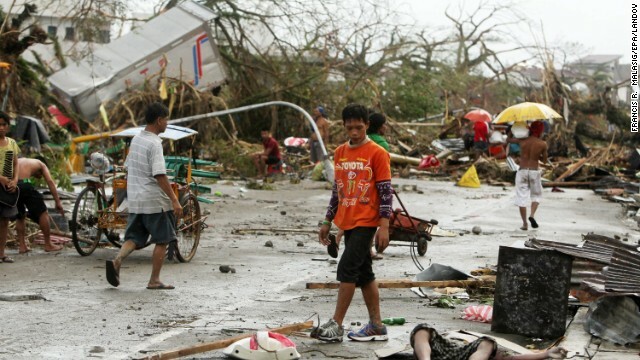 More than 580,000 people in the Philippines have been displaced in the aftermath of the storm, disaster officials said. 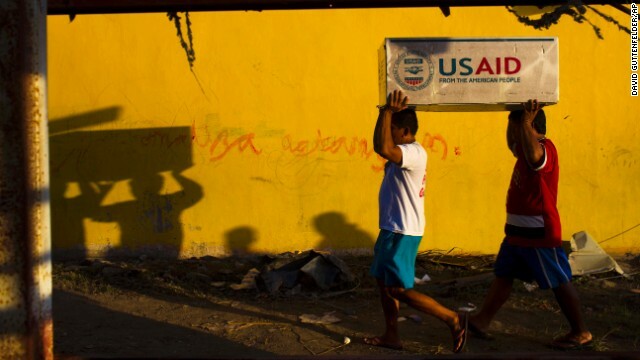 Of those, about 286,000 people are being housed in 993 evacuation centers, the officials said. 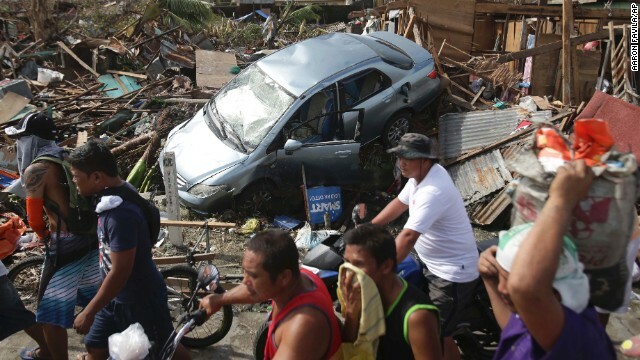 Aquino defended the pace of relief to some of the hardest hit areas. 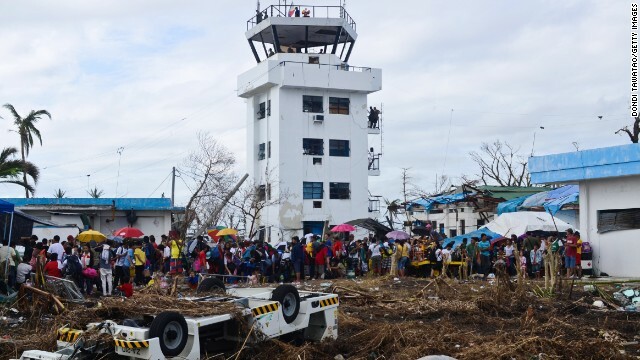 The typhoon simply overwhelmed the ability of two or three local governments to do their jobs, which include taking care of the initial response, Aquino said. For example, in Tacloban, only 20 of 290 police were available when disaster struck; many were tending to their own families, he said. The national government "had to replace a lot of the personnel with personnel from other regions to take care of government's vital functions," Aquino said. The Philippines Armed Forces has increased troops and military engineers in Tacloban, and the army will fly aid to survivors in remote areas around the city with 11 helicopters and as many trucks. The exodus from the ravaged areas is adding to road congestion, further slowing help from getting in. 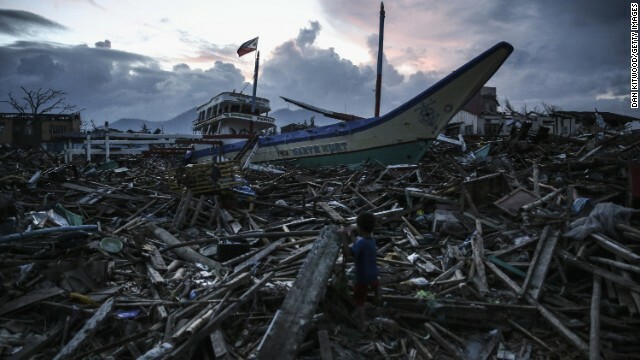 At least 29 nations or government groups have sent or pledged aid, according to the Philippines government. 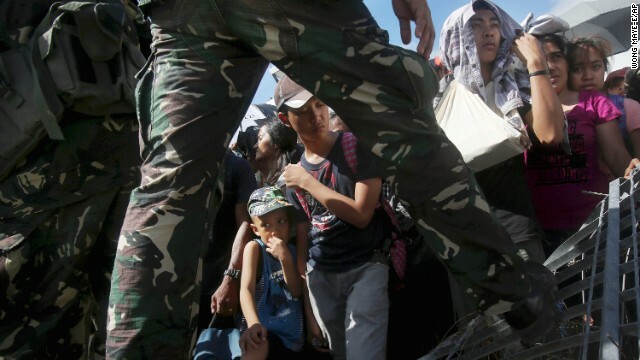 The aid includes $25 million from the United Nations, $4 million from the European Union, $16 million from Britain and $10 million from the United Arab Emirates, home to a large population of expatriate Filipino workers. In Hong Kong, the U.S. Navy rounded up sailors on shore leave from the USS George Washington and ordered the aircraft carrier's strike group to make "best speed" for the Philippines. Its air wings will deliver supplies and medical care to survivors. 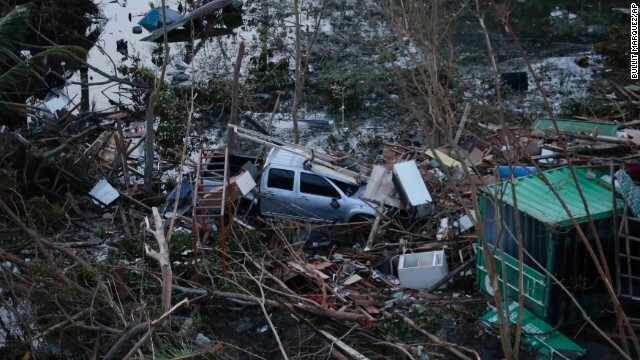 The Pentagon ordered more Marines from Japan to join the relief effort, and the U.S. Navy was also preparing three amphibious assault ships to head for the region, a senior Pentagon official told CNN. Among other things, such ships can turn seawater into desperately needed potable water. Experts from Doctors Without Borders, Oxfam and other organizations, as well as U.N. and U.S. civilian disaster assessment teams, were on the scene. Belgium and Russia sent field hospitals. The European Union sent €3 million ($4 million) and two Boeing 747 aircraft loaded with supplies. Israel loaded up two 747s with 200 medical personnel and supplies. But it will almost certainly continue to be difficult to get that aid to survivors. Many roads remain blocked, and electricity is out in many areas, making it difficult to operate at night. 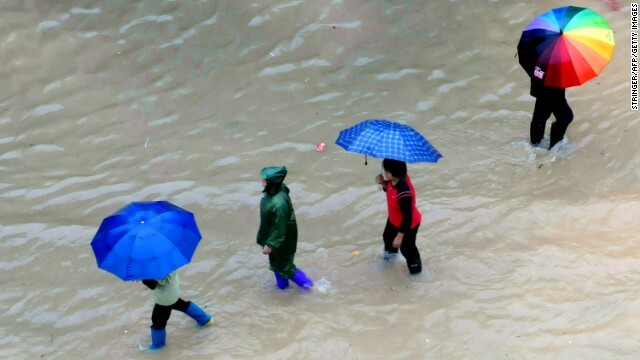 Complicating matters, a new tropical storm, Zoraida, blew in Tuesday delivering more rain, the Philippine national weather agency PAGASA reported. Zoraida is not a strong storm, but it has dumped just under 4 inches of rain in some places, CNN meteorologists say. 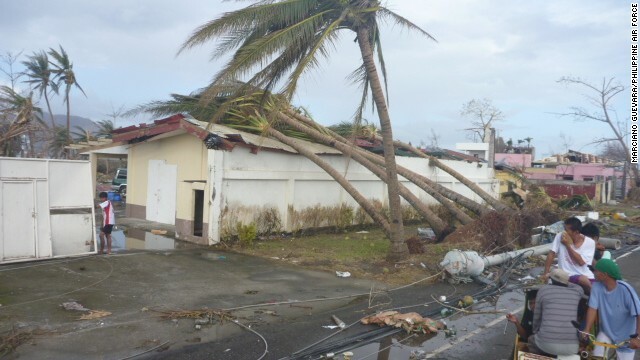 It was holding up desperately needed aid in at least one province, Iloilo, where Gov. Arthur Defensor Sr. grounded relief flights until it passed. 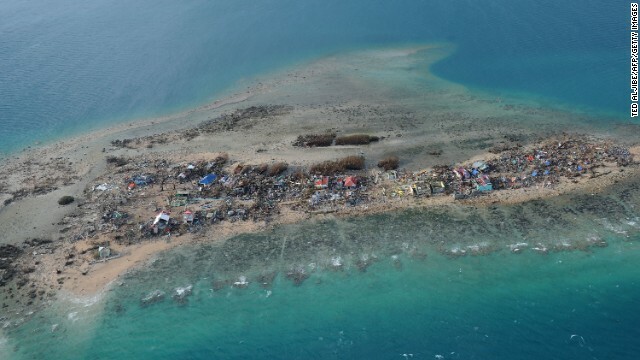 Zoraida also slowed air aid in the neighboring province of Cebu, an official said, although military planes continued flying at the maximum allowed level of risk there. Amid the despair, there were moments of joy. In Cebu, Fritz Anosa was reunited with his parents, who live in the hard-hit city of Guiuan where the storm made its first landfall in the Philippines. 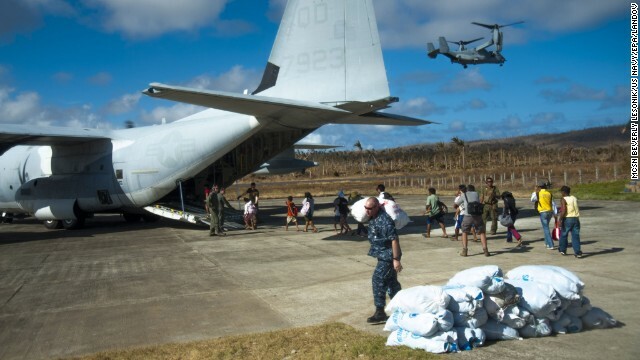 They were able to make it onto a Philippines Air Force C-130 making a return flight to deliver aid to the devastated community. "When I first saw them, I was just so happy that we all broke down in tears," he said. "When I saw them, it was like, 'God, thank you for this big miracle.'" Late Tuesday, CNN iReporter Debra Thomas found Sebastian Makison, the young man she has raised since high school. He was in the Philippines for volunteer work. Family members worked through Facebook and Twitter to find him, and a volunteer worker saw the posts and connected them. They visited over Skype late Tuesday night, bringing tears of joy. "I am praying for the rest of the families and I hope they are as lucky as we are," Thomas said. 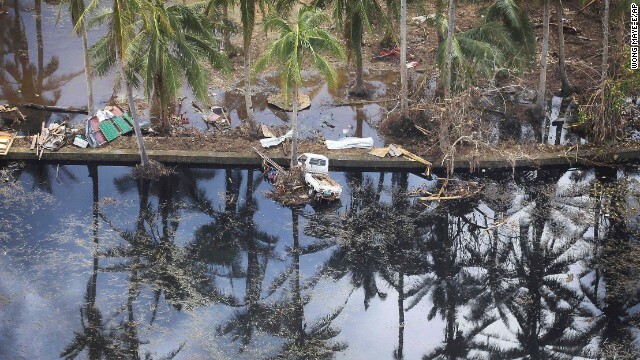 CNN BELIEF BLOG: Where was God in the Philippines? 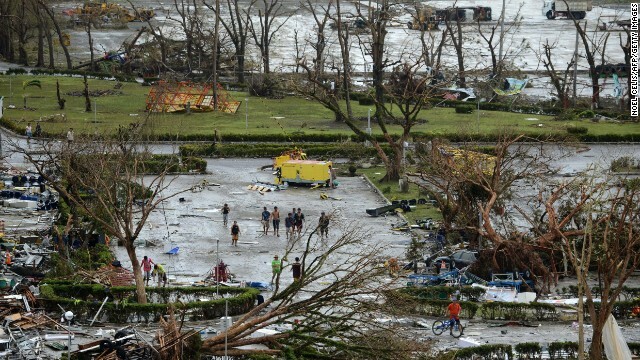 CNN's Nick Paton Walsh and Paula Hancocks reported from Tacloban; Chelsea J. Carter reported and wrote from Atlanta. CNN's Ben Brumfield, Michael Pearson, Ivan Watson, Barbara Starr, Matt Smith, Jessica King, Saad Abedine, Jethro Mullen, Catherine E. Shoichet, Neda Farshbaf, Andrew Stevens, Kristie Lu Stout, and Jessica King contributed to this report.